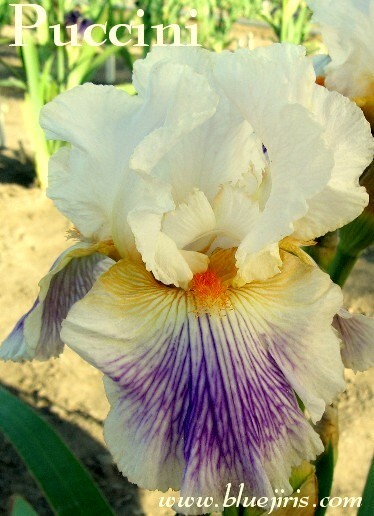 creamy white;F-w/ wide red vio.dot.brdr;B-white; ruf; sl.sweet frag. 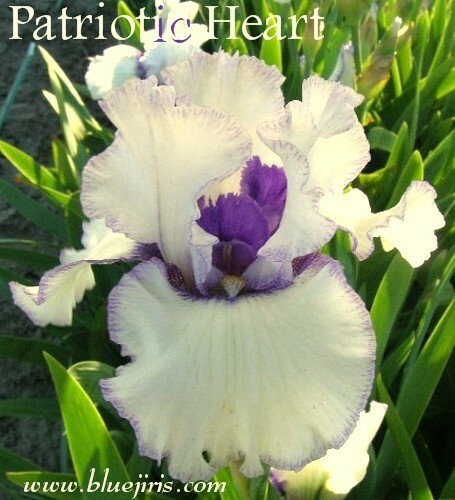 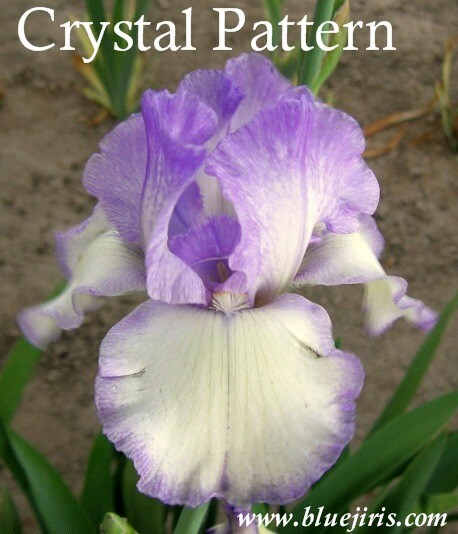 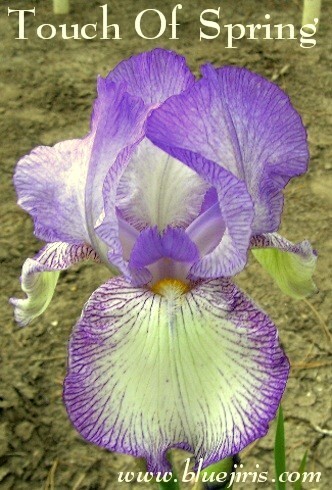 S(SA)-white, wash aster violet; F-white, veined/dot as.violet & on 1/2" edge; B-old gold, violet end; ruf, sl.sw.frag. 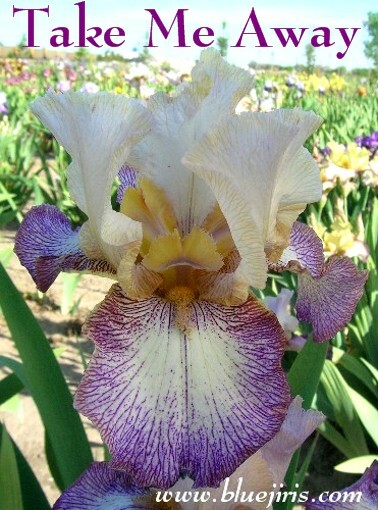 S-cream white, lgt orchid edg;SA-dp.orch. 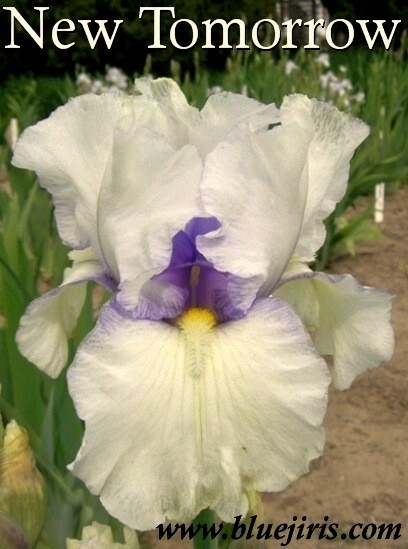 ;F-white, fine orch.edg;B-yel, wht end;lgt.ruf;sl.sw.frag. 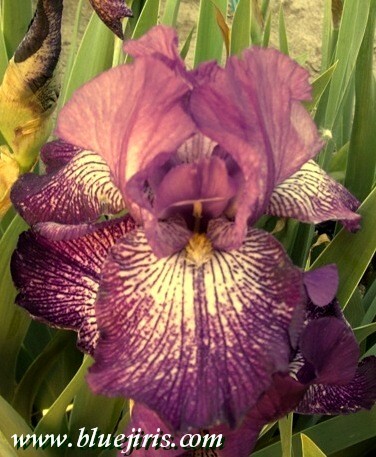 Going My Way X Hey Looky. 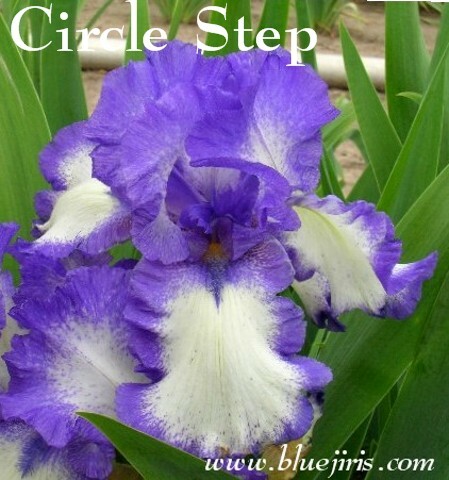 Winner's Circle X 66-73-19, sib. 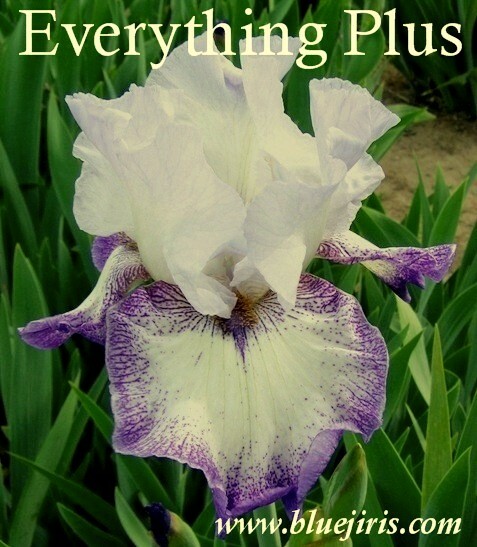 Everything Plus X (Spinning Wheel x Bouree). 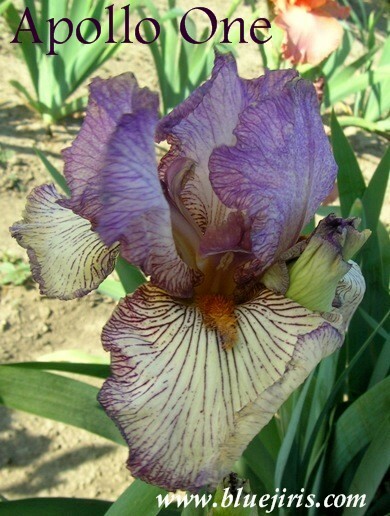 Eagle's Flight X Cinnamon Girl. 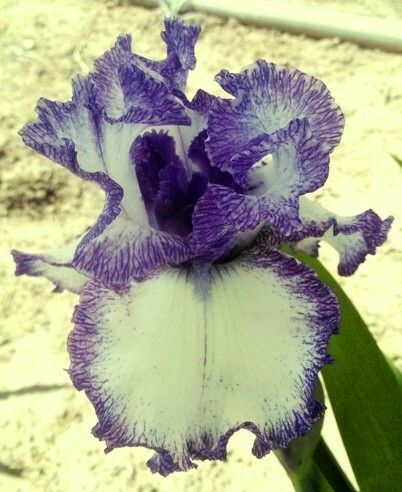 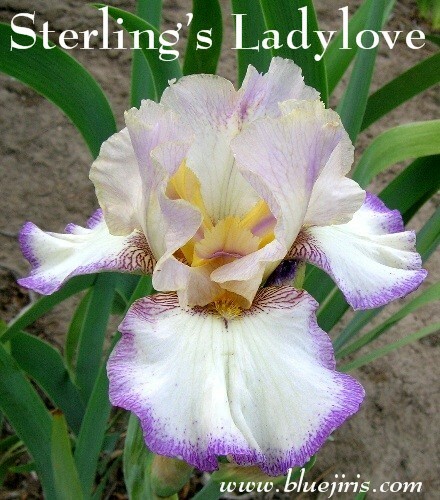 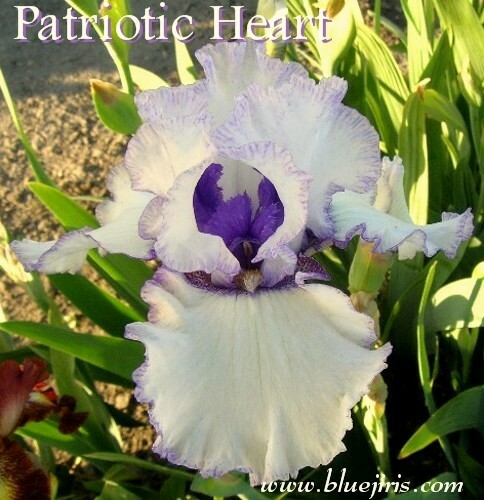 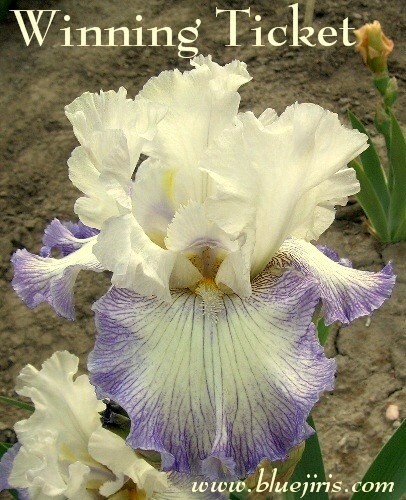 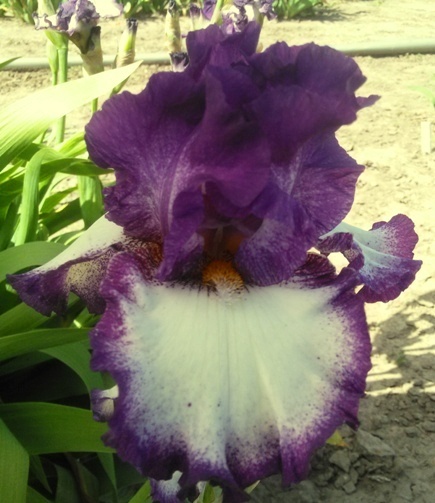 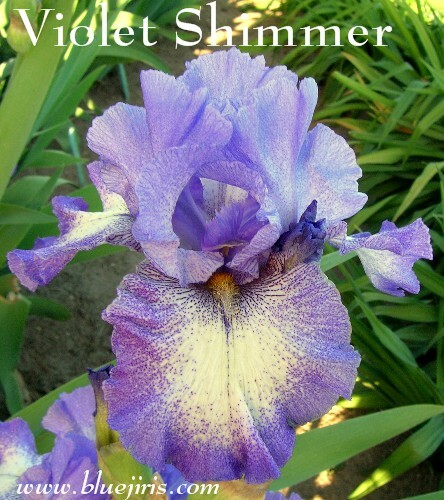 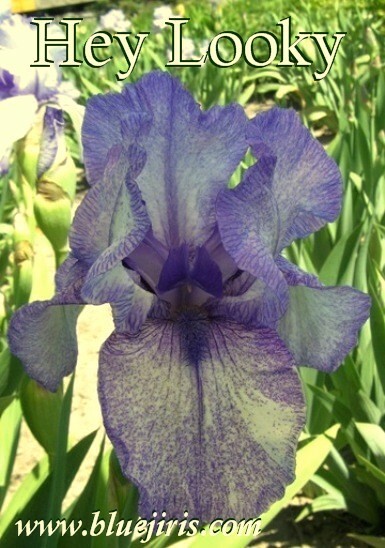 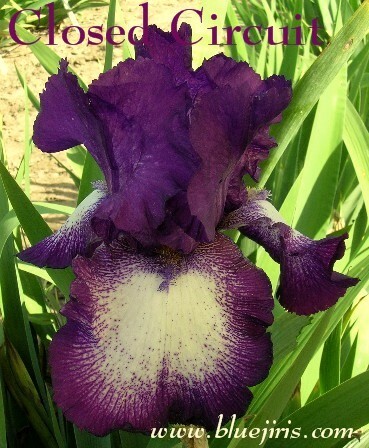 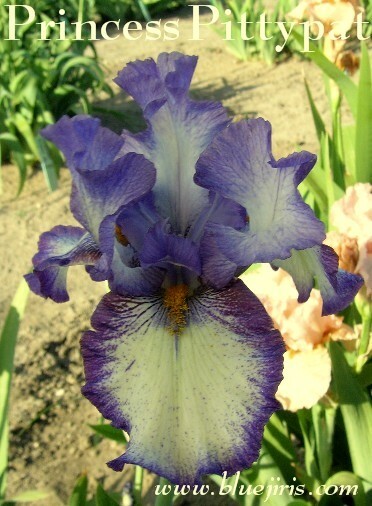 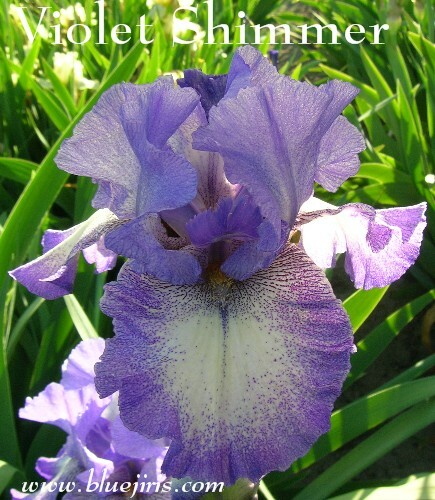 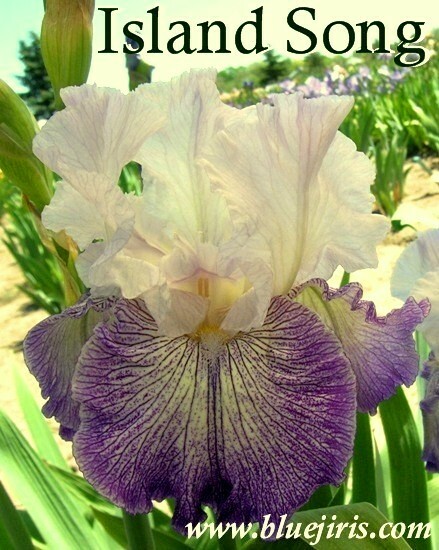 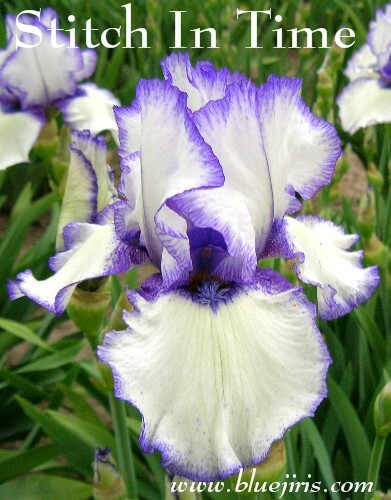 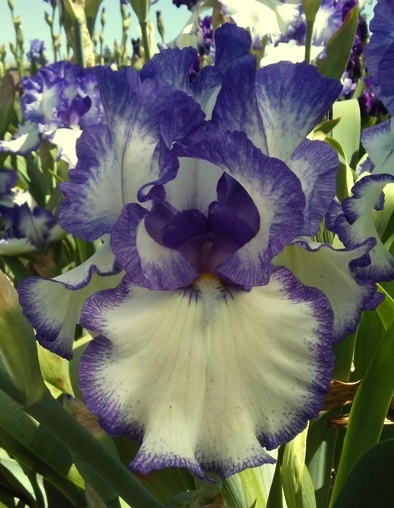 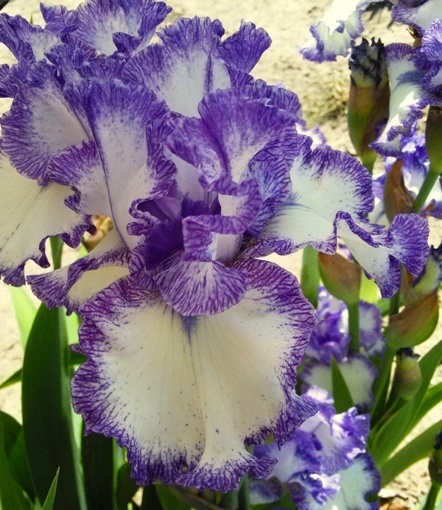 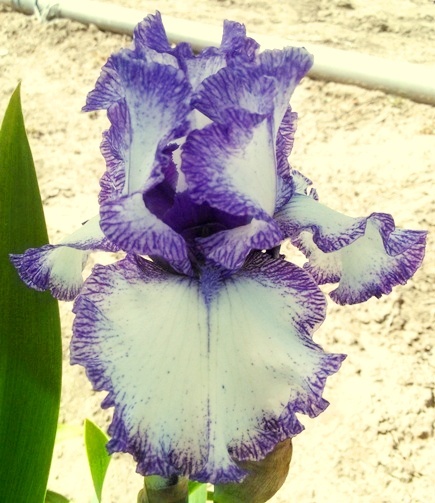 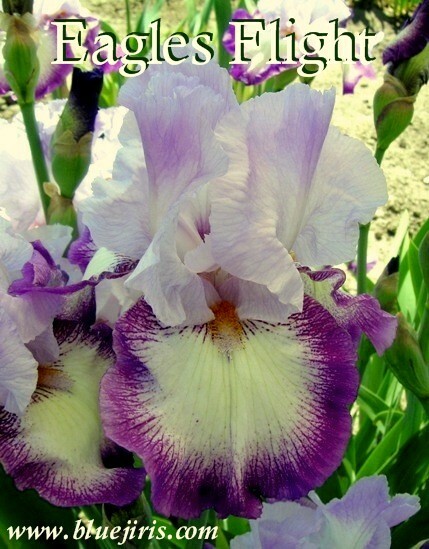 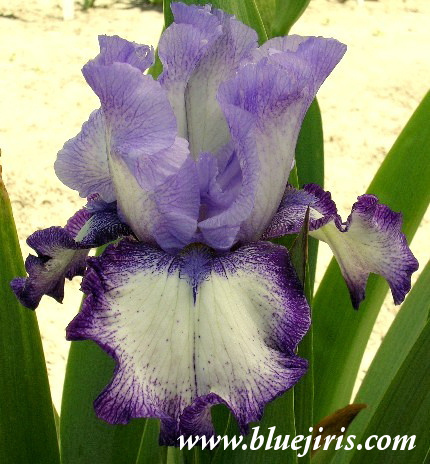 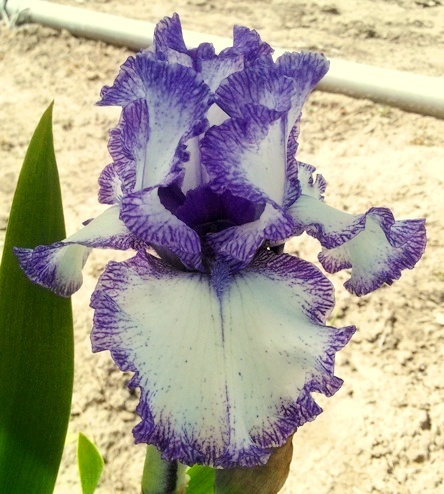 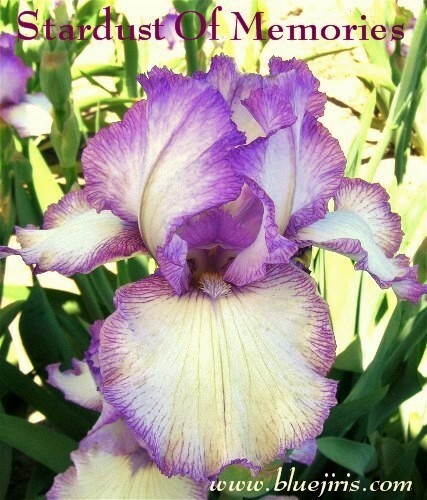 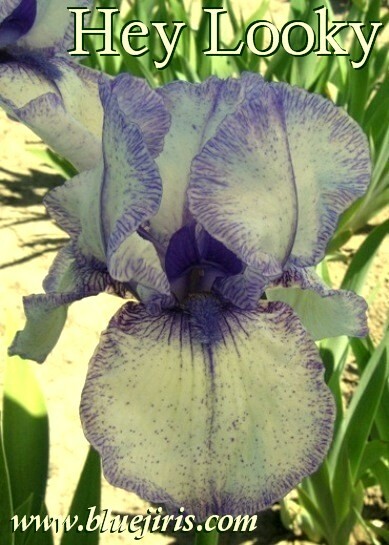 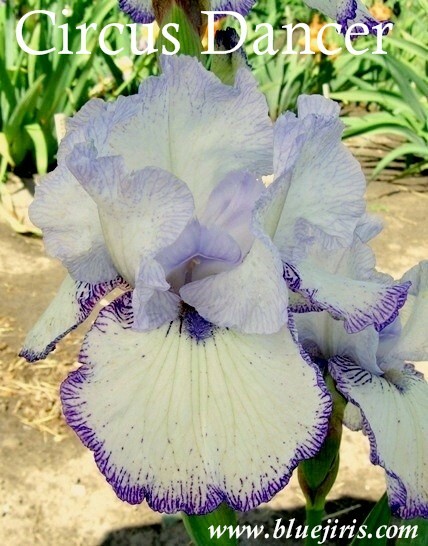 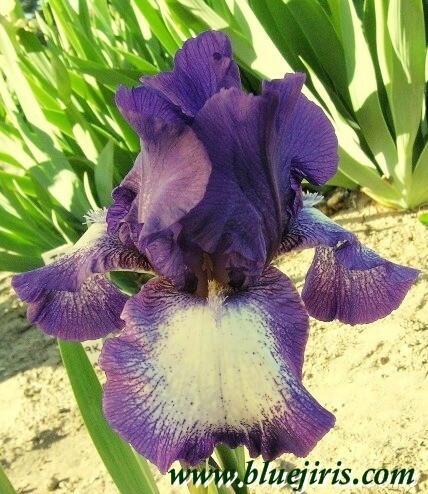 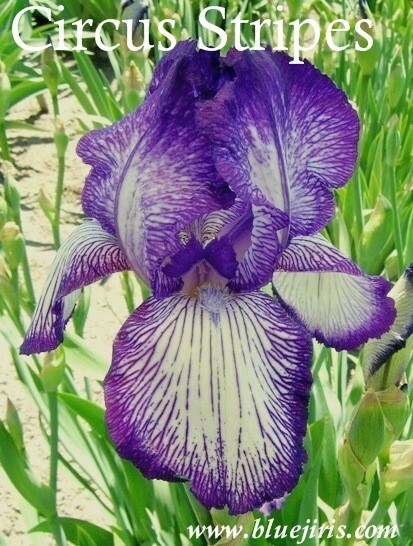 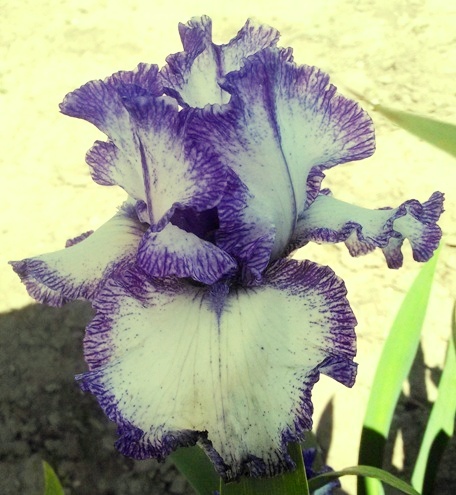 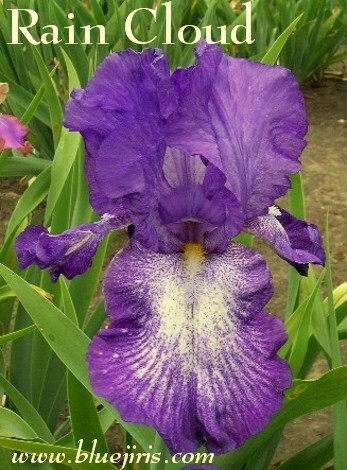 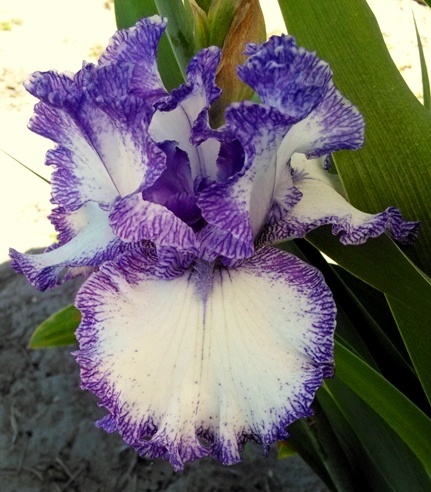 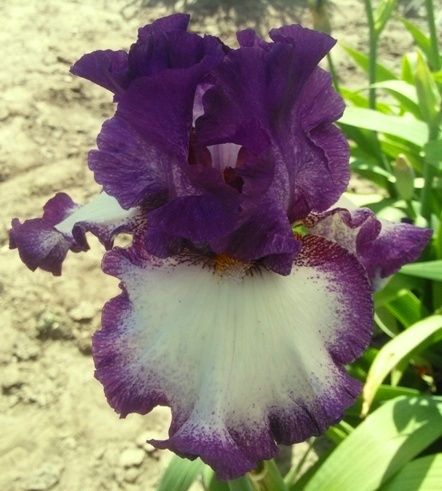 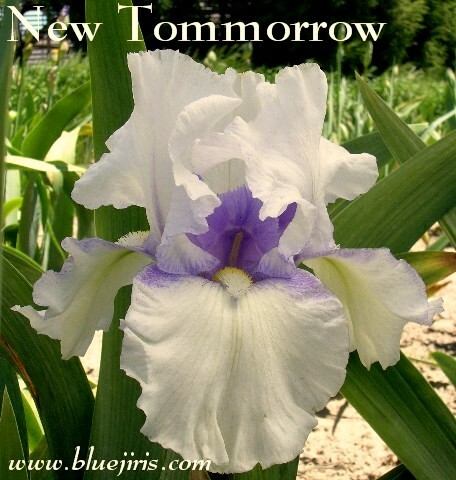 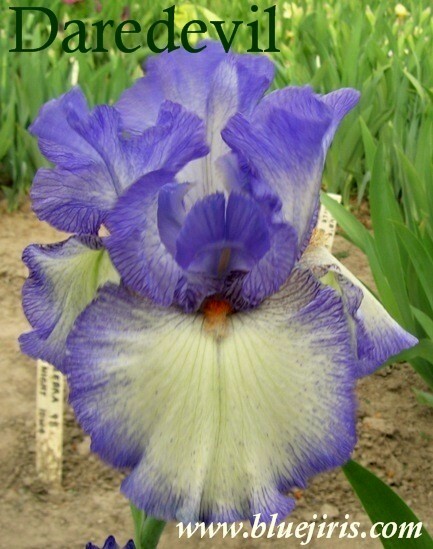 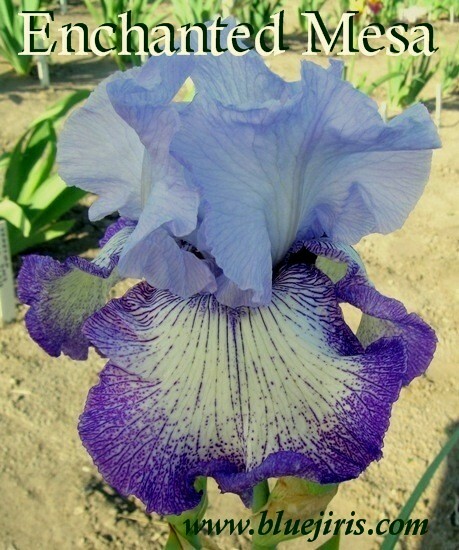 S-lt.lavender blue;F-wht grnd,3/8"purp.edg,speckd.purp.hafts;B-purp,tips gold; ruf,sw.frag. 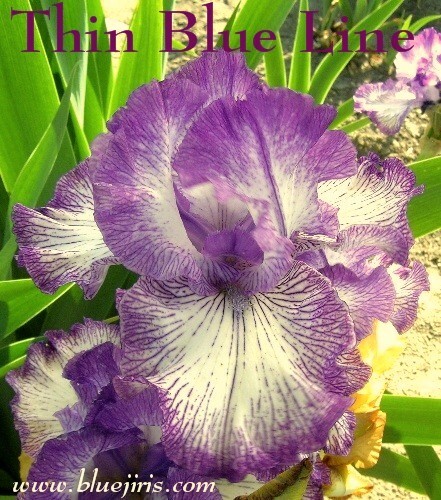 S-lav.blue,~dpr.mdrib;F-navy blue vio,1/8"lav.blue band,hvy.white striat.1/2down;B-tanger.oran,white base;sl.sw.frag. 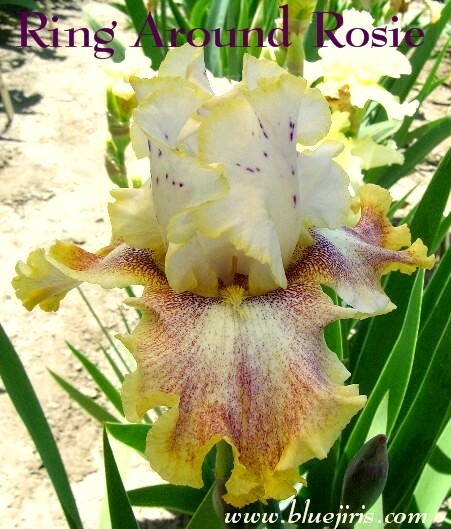 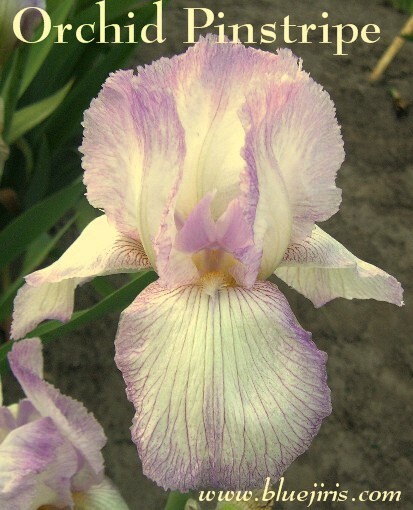 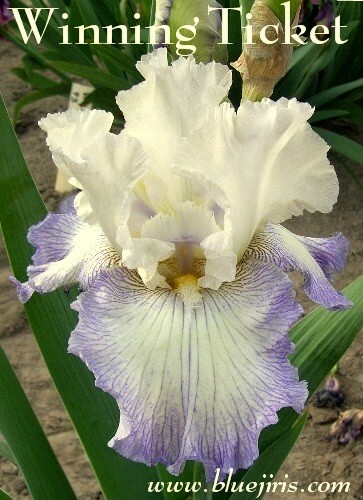 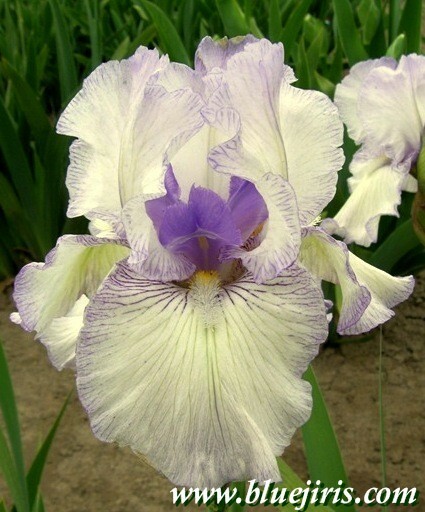 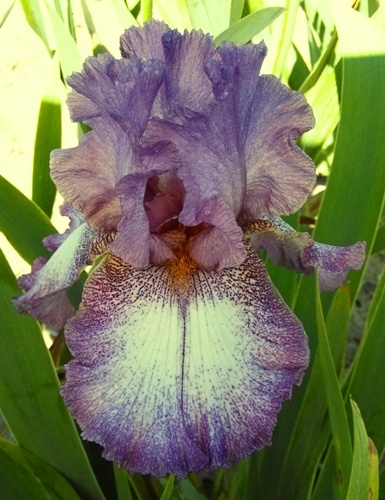 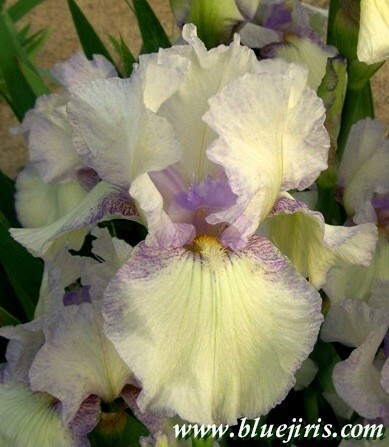 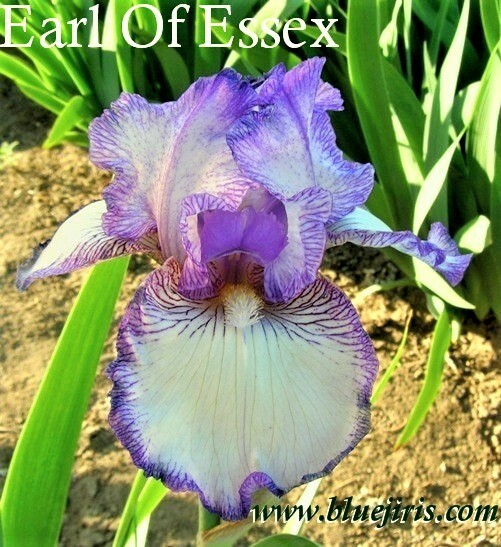 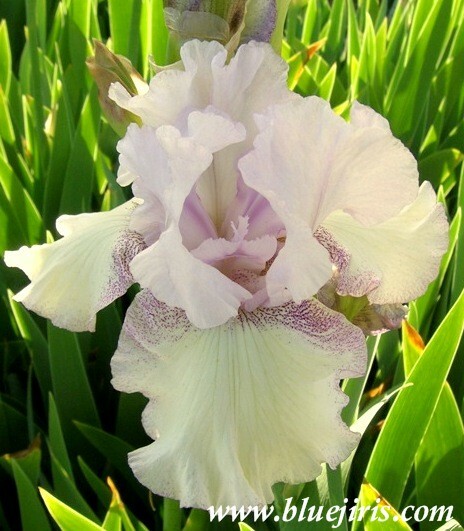 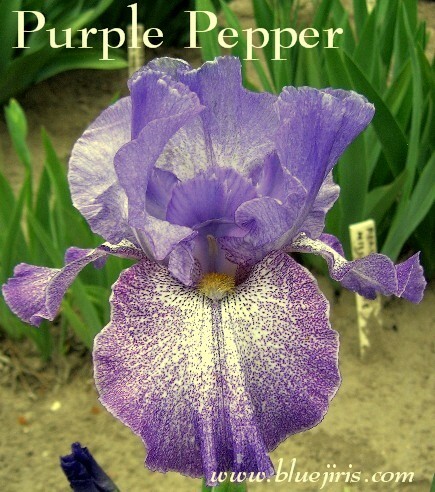 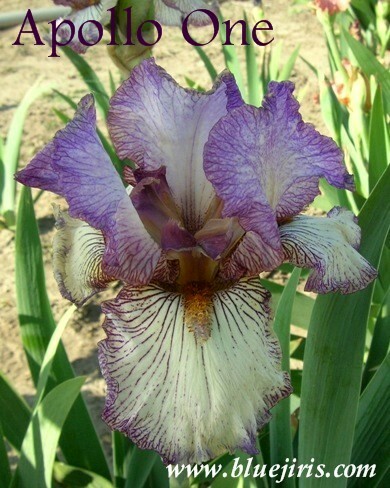 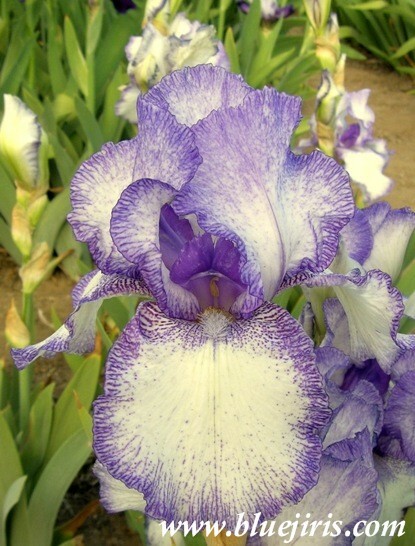 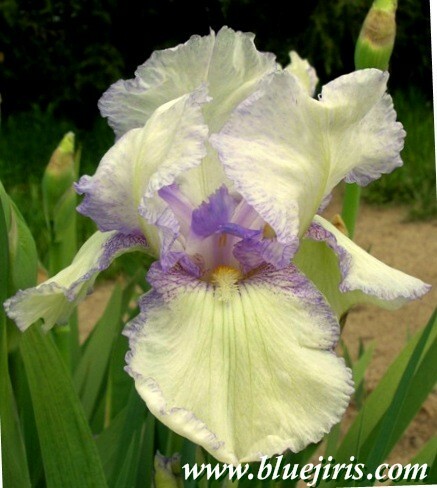 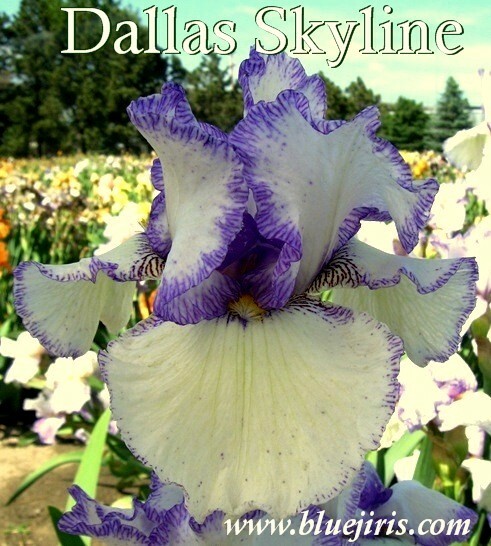 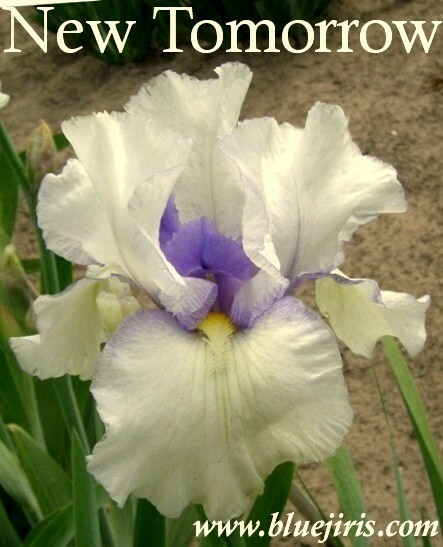 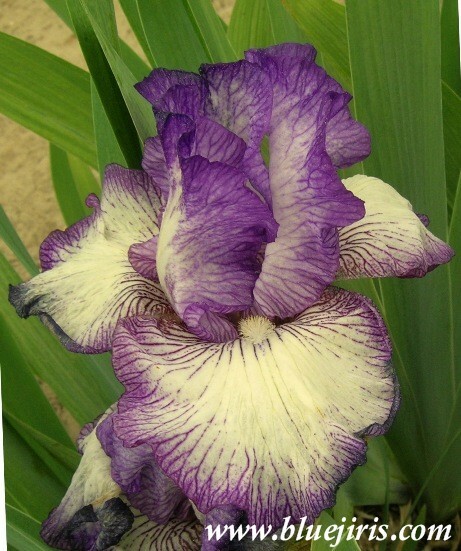 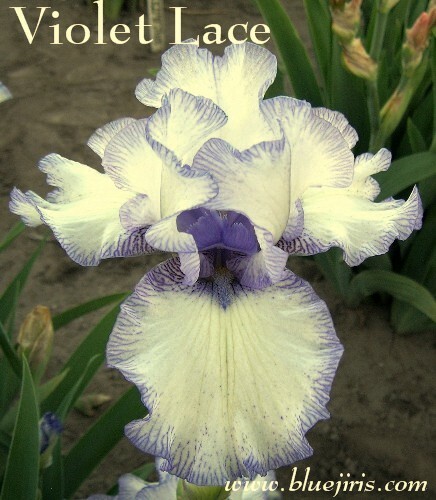 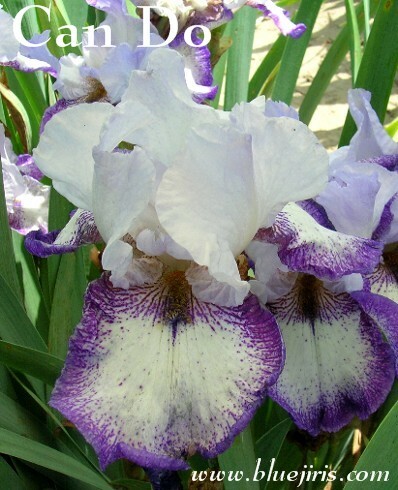 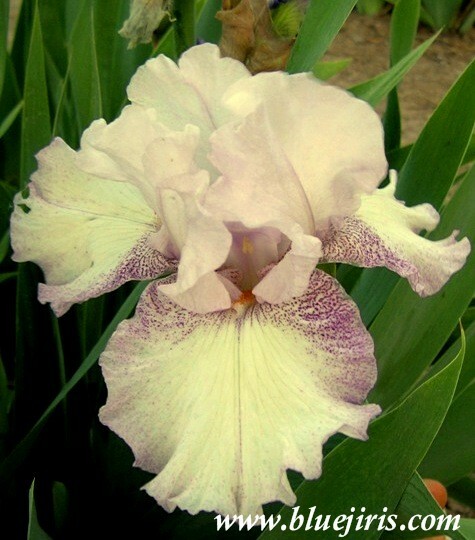 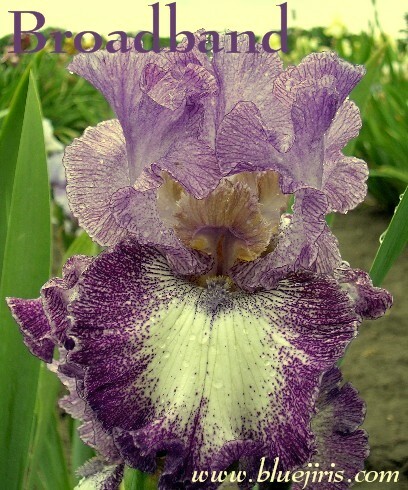 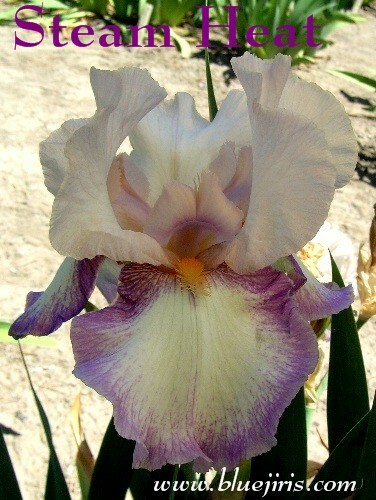 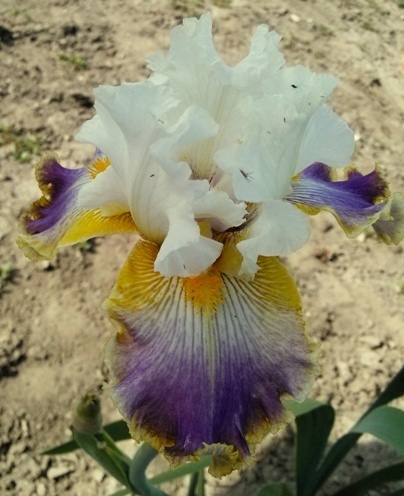 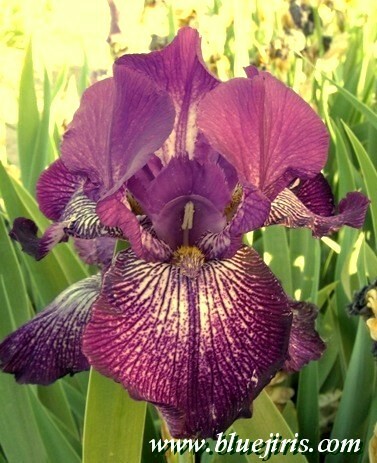 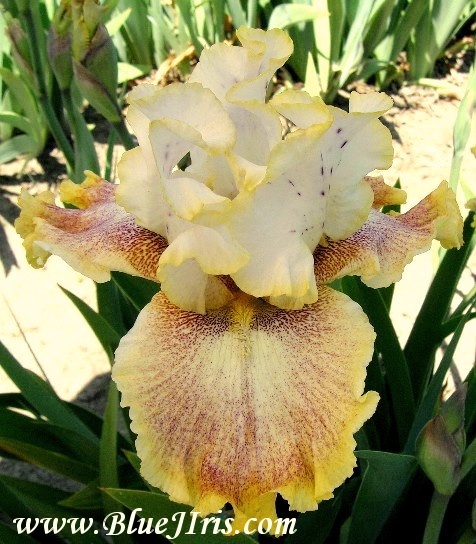 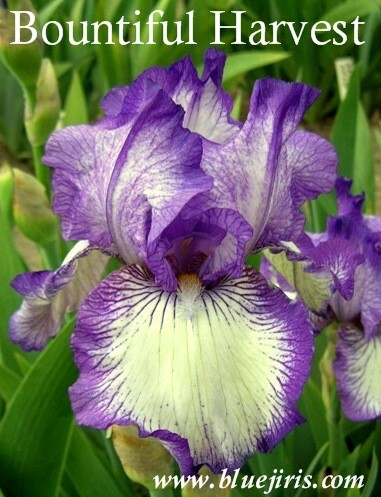 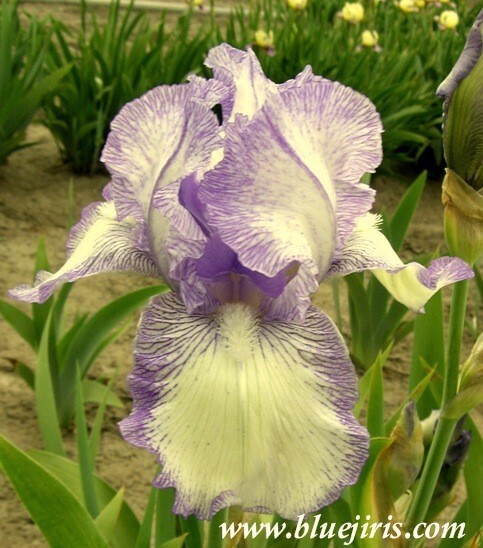 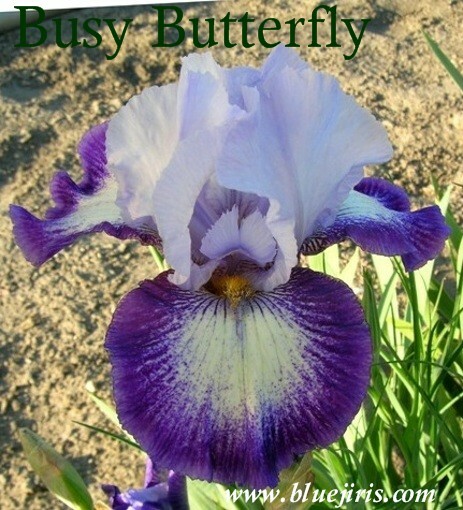 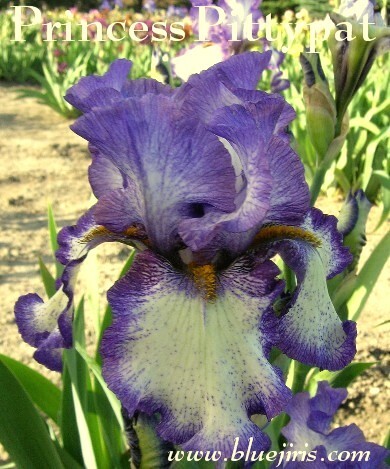 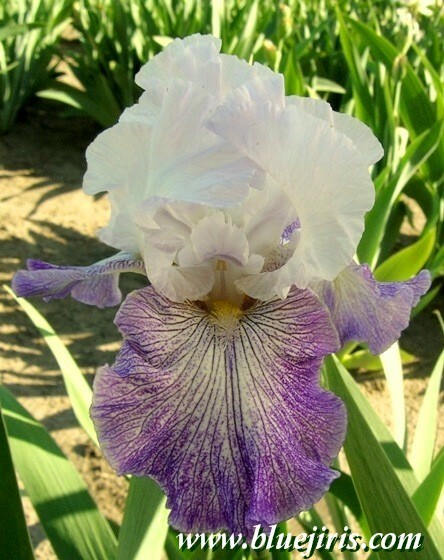 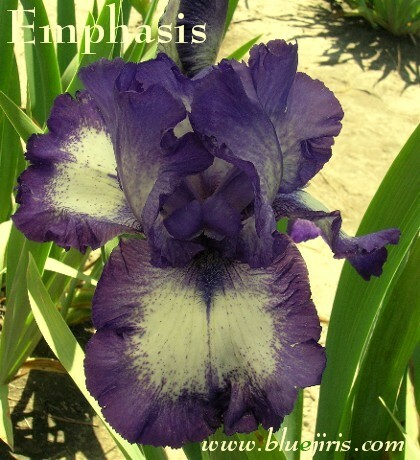 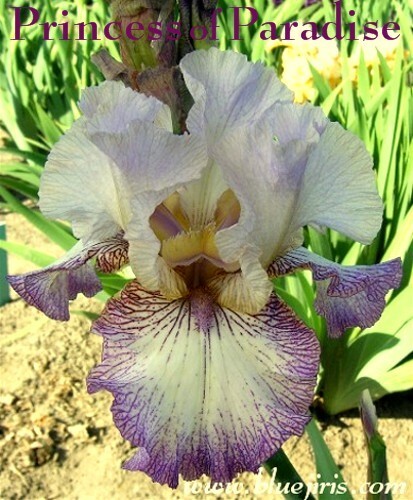 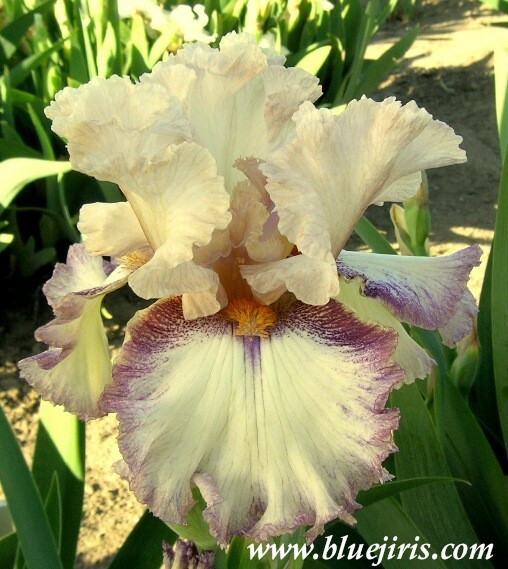 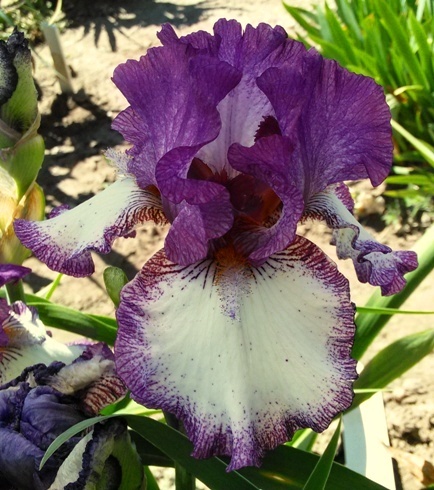 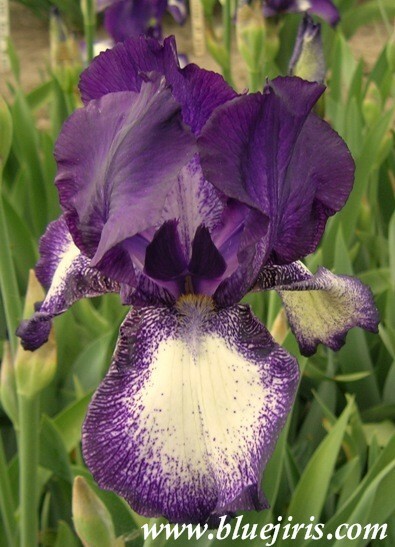 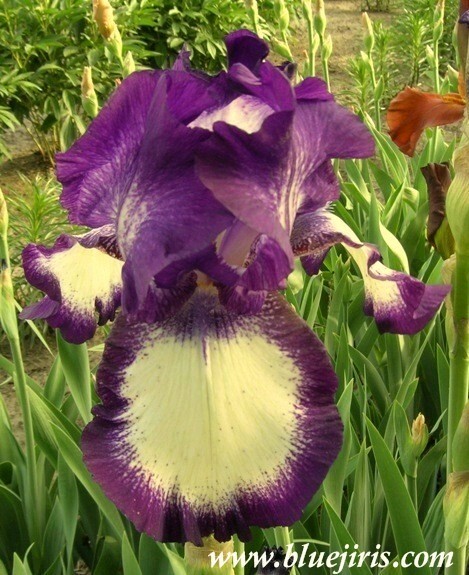 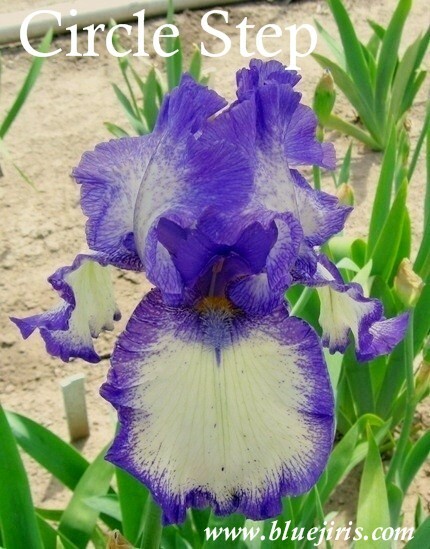 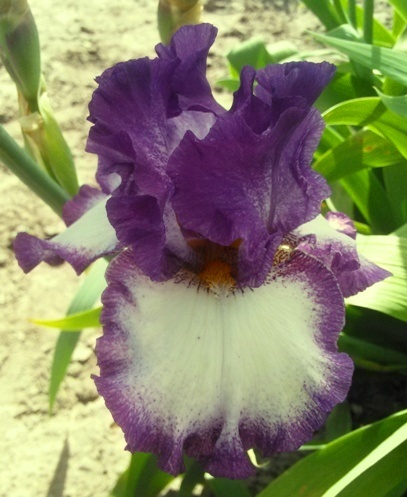 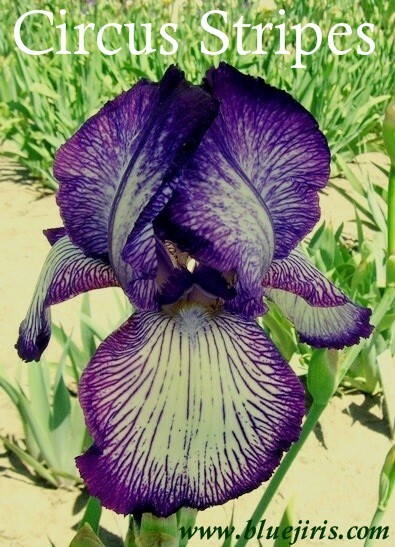 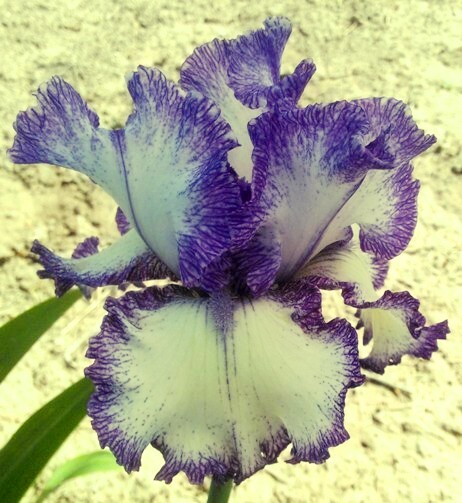 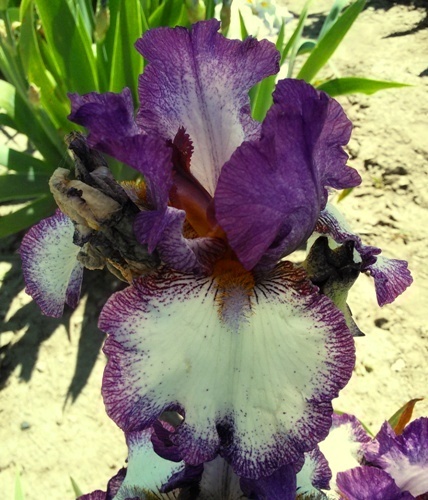 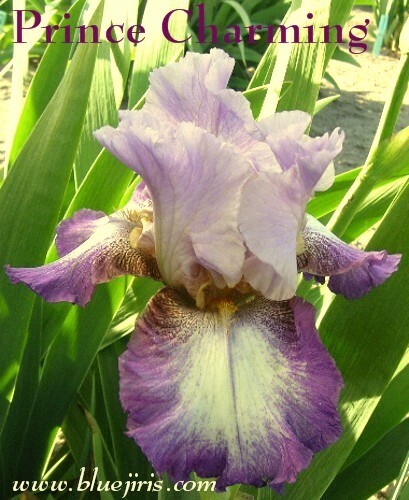 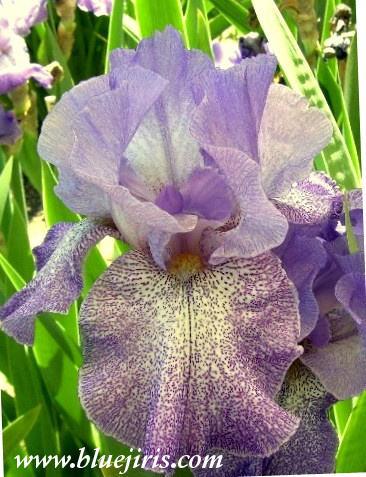 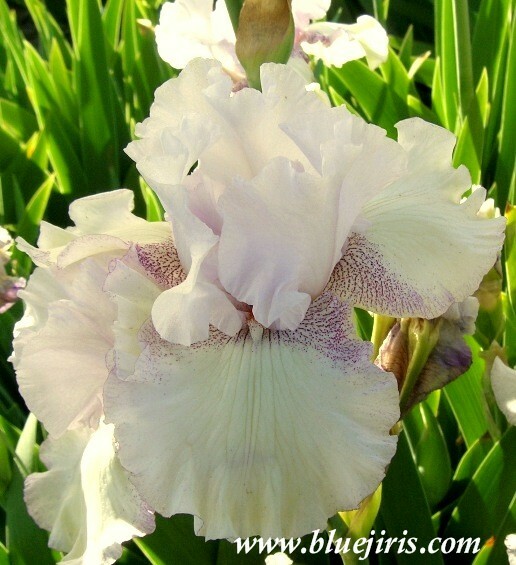 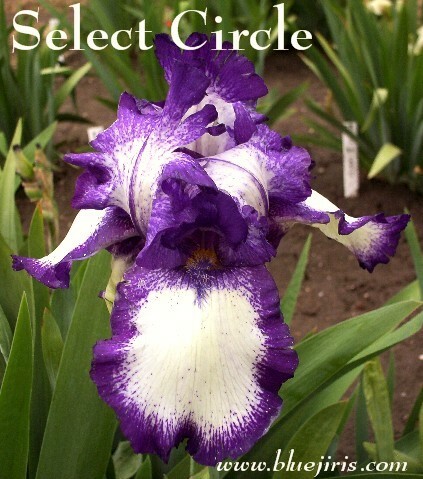 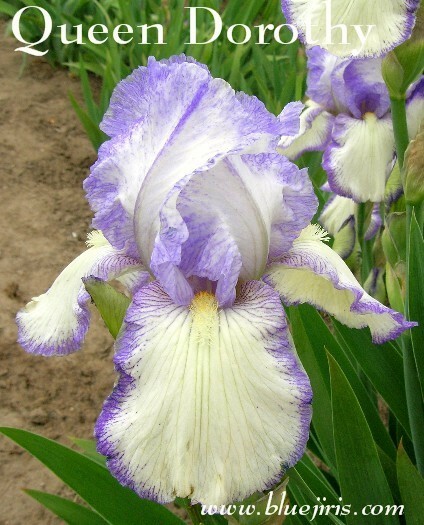 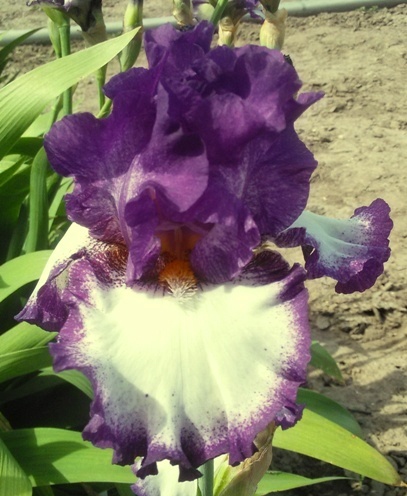 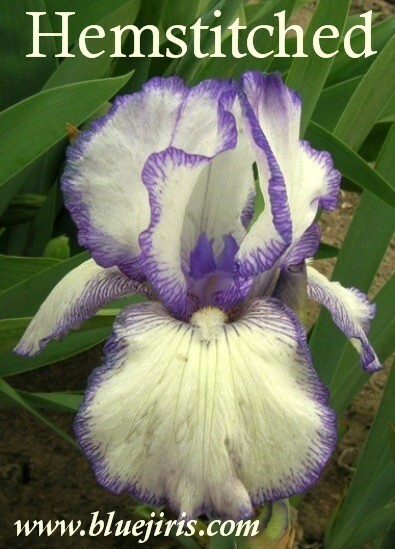 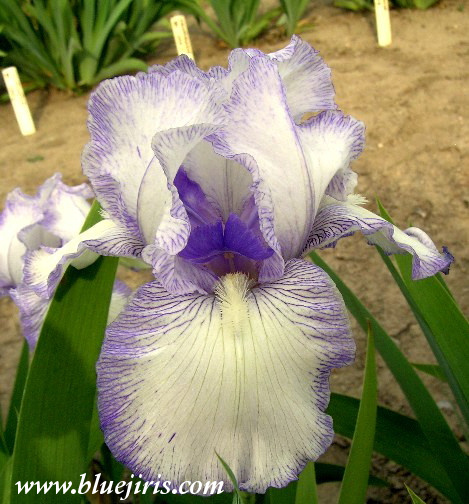 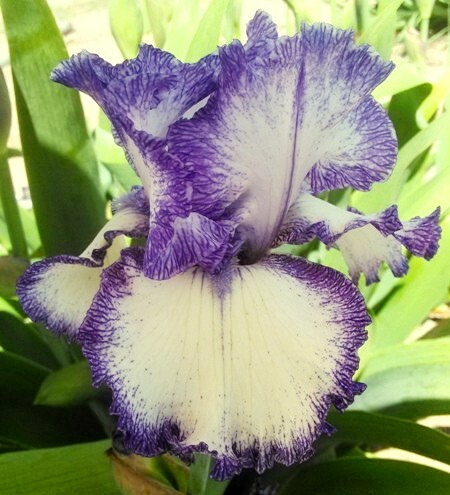 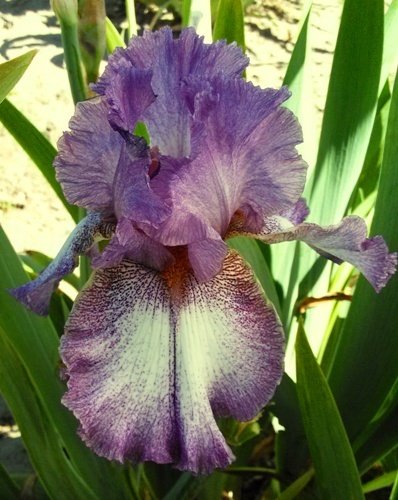 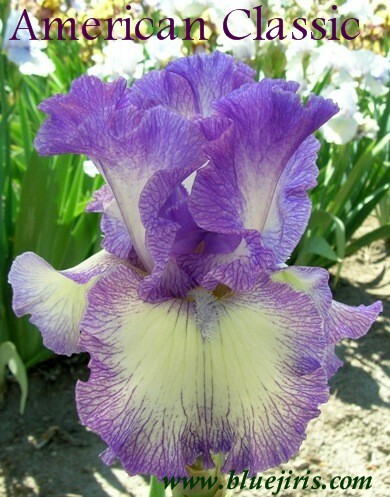 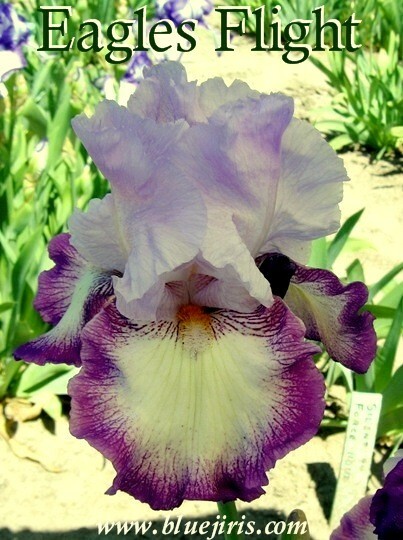 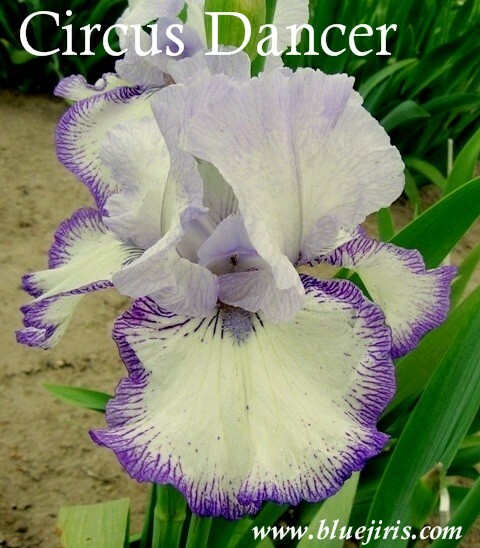 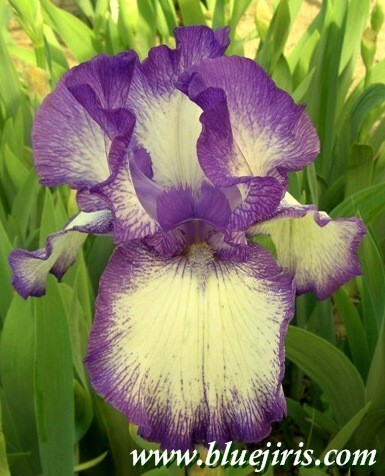 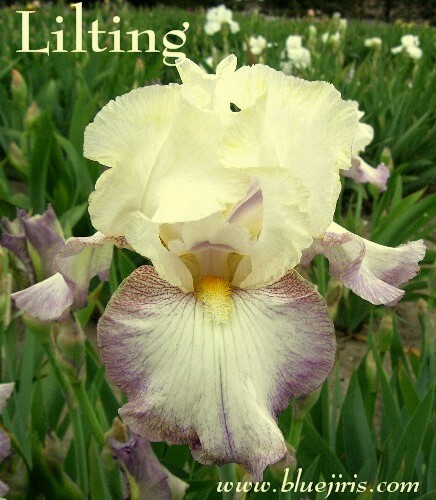 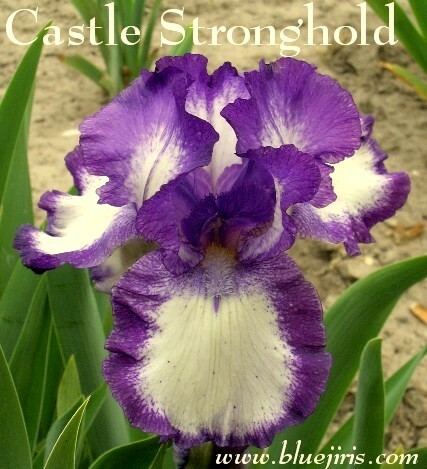 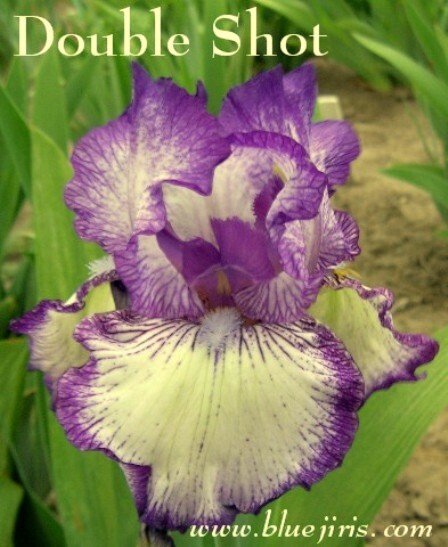 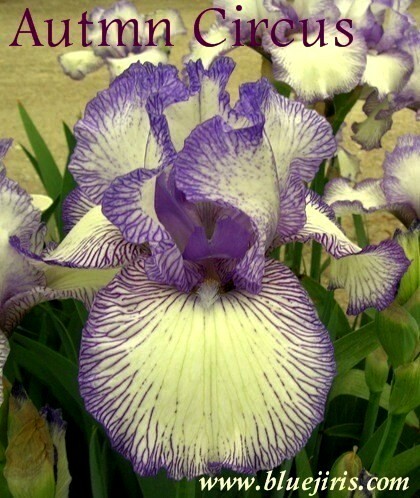 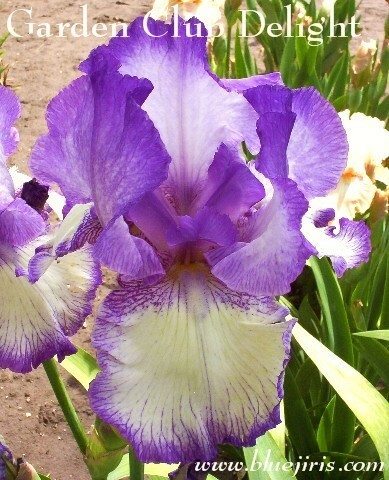 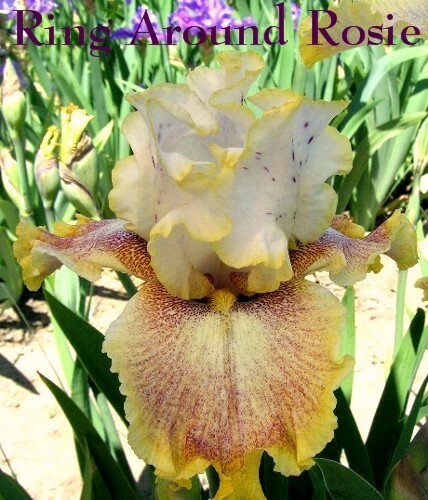 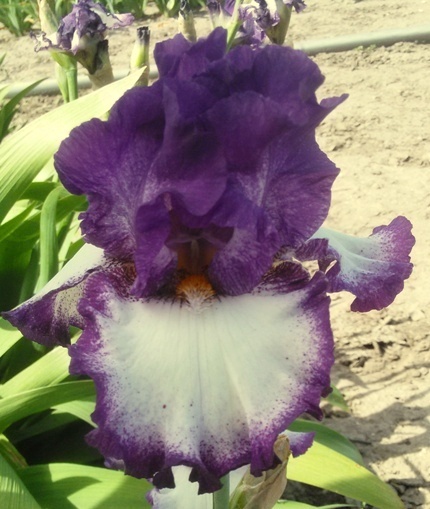 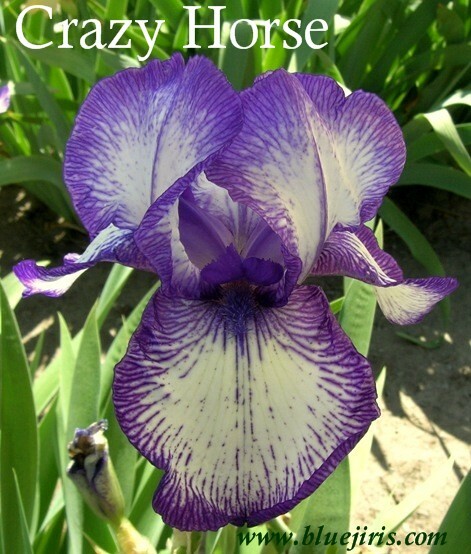 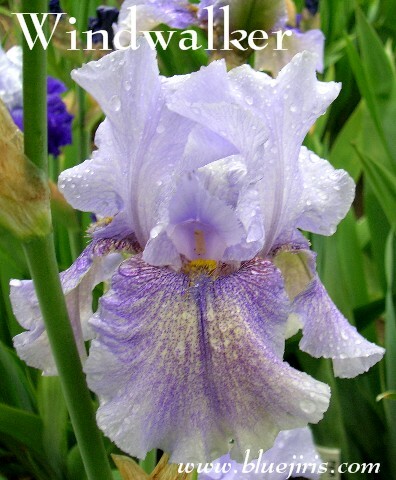 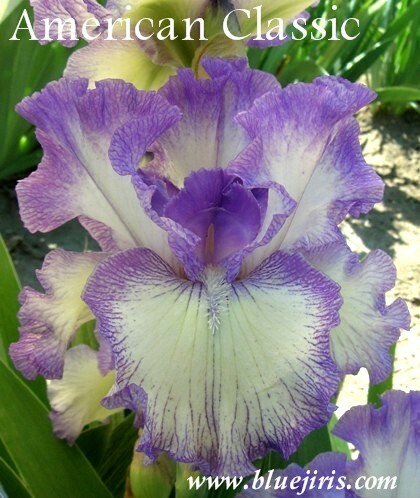 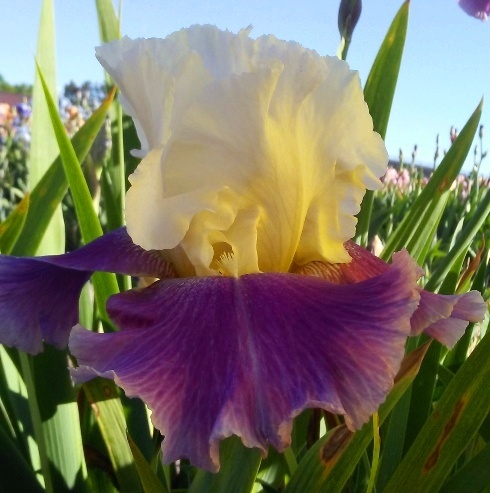 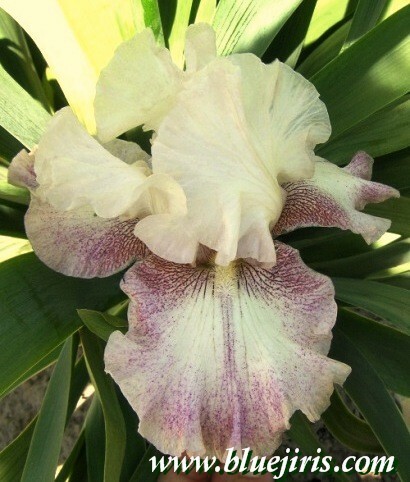 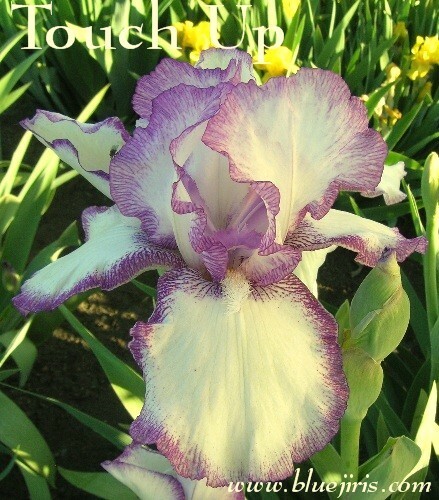 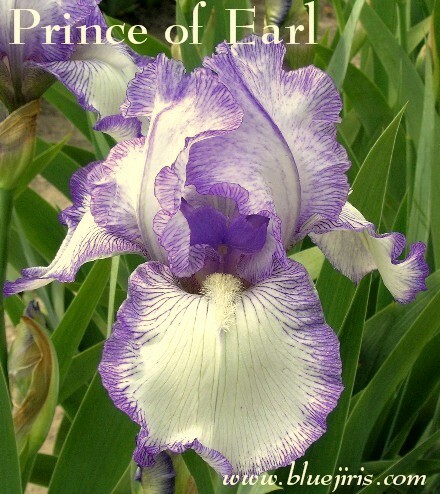 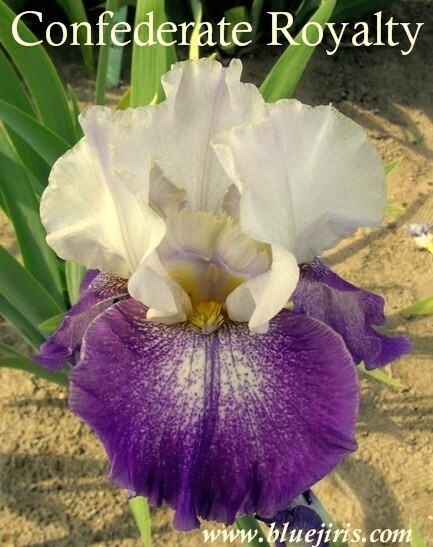 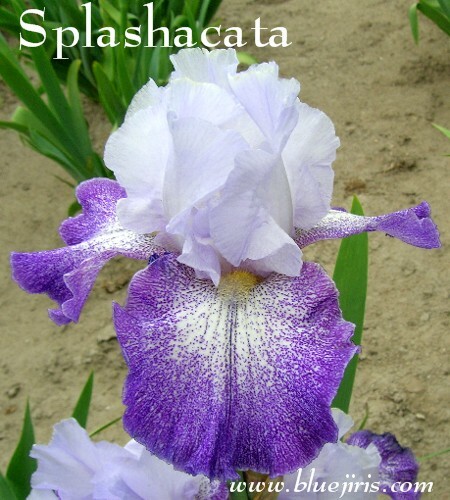 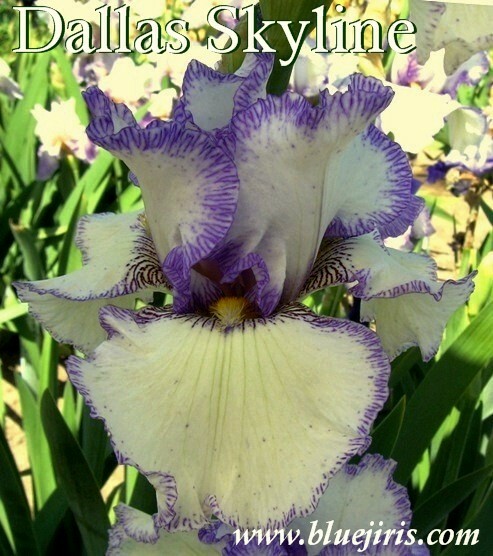 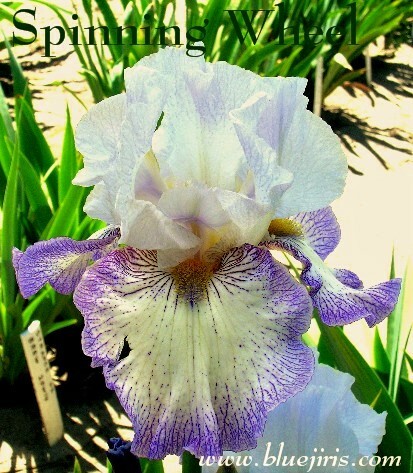 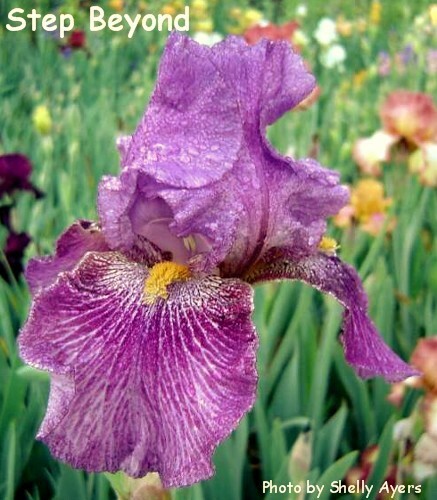 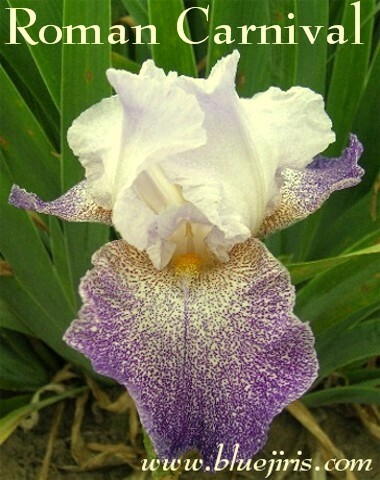 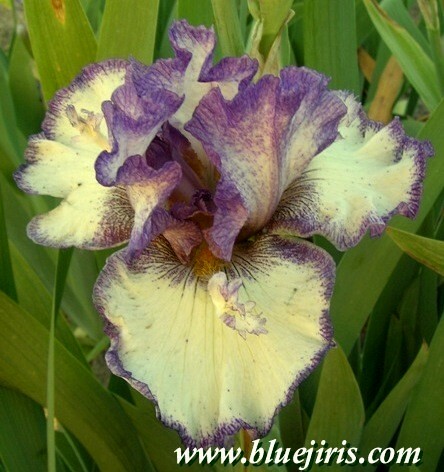 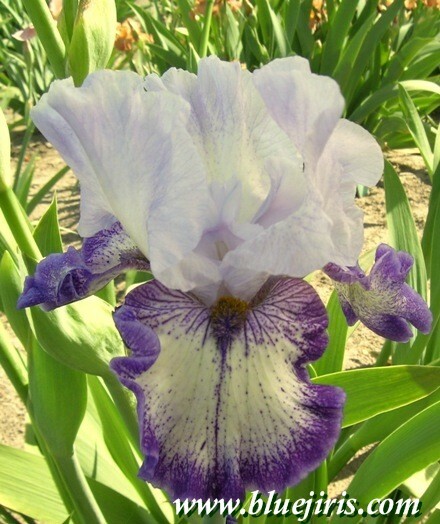 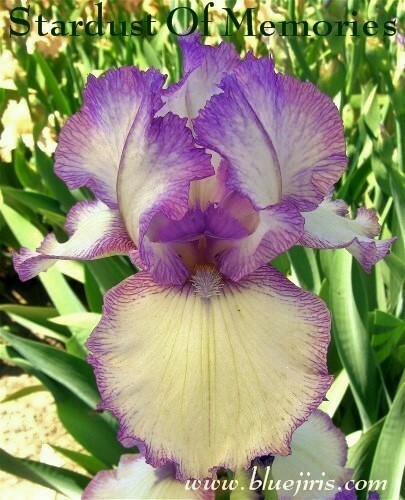 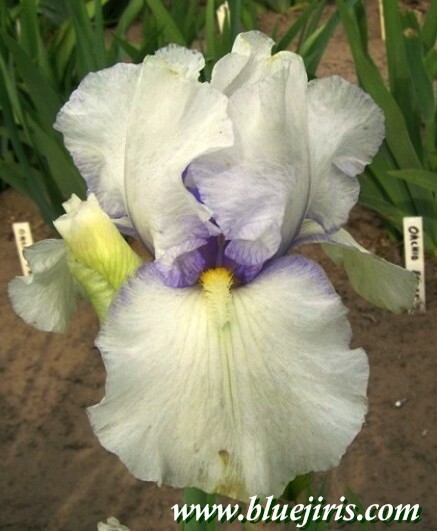 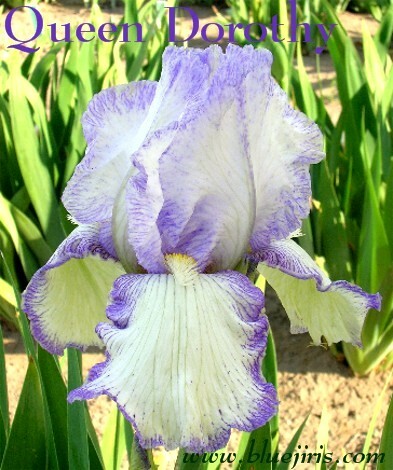 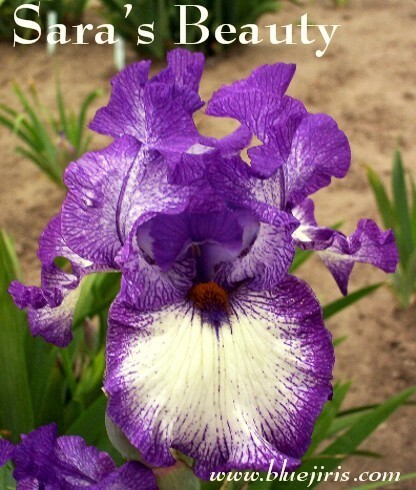 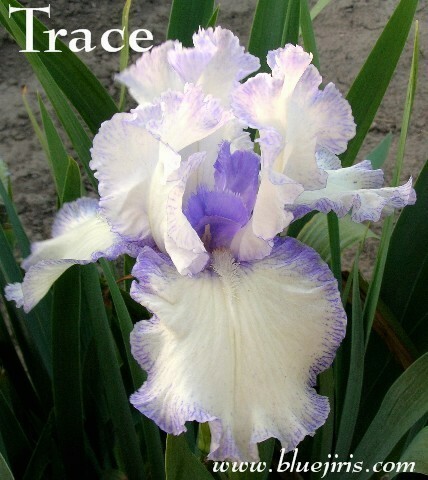 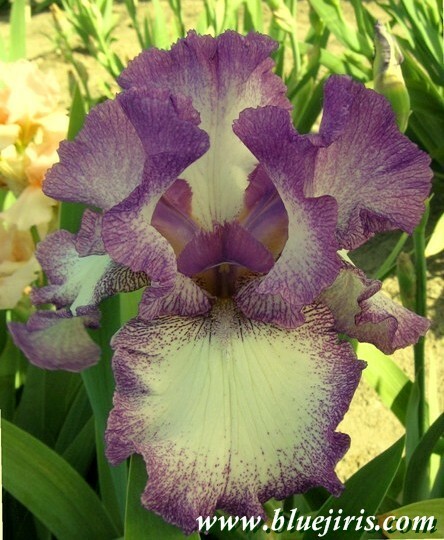 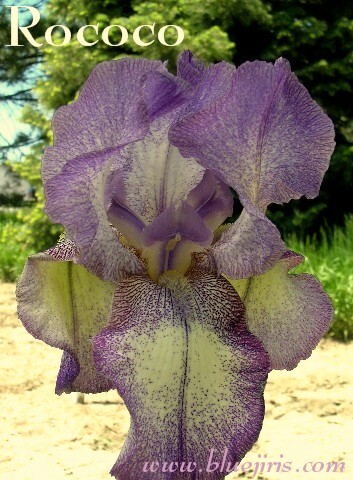 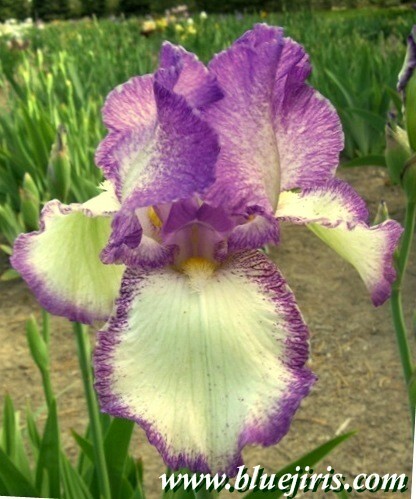 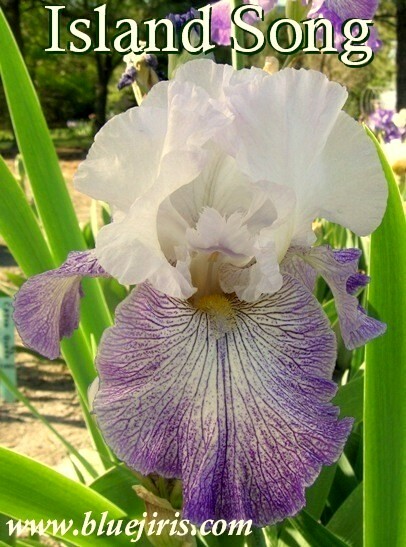 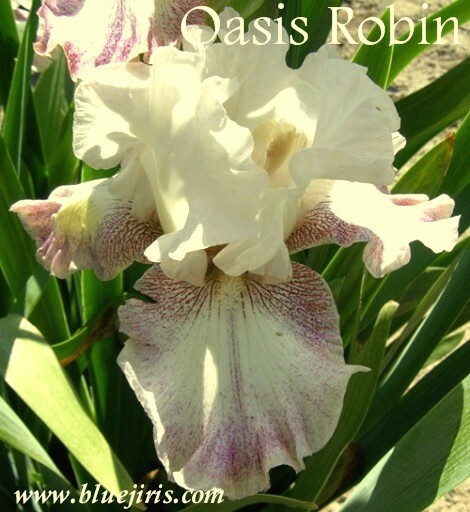 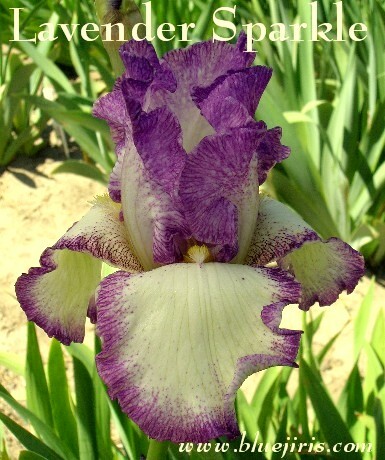 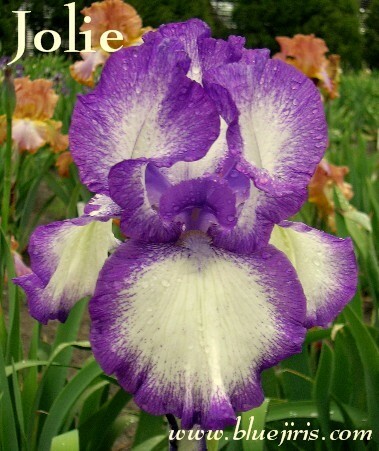 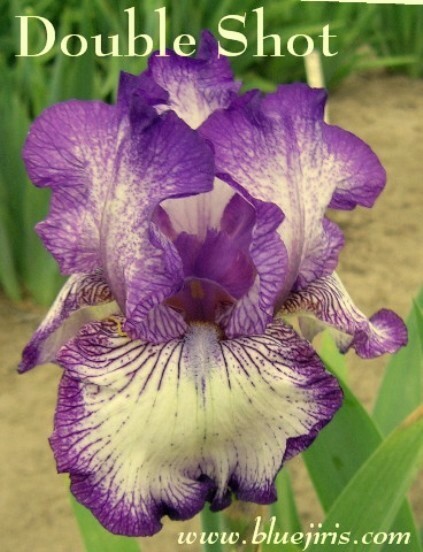 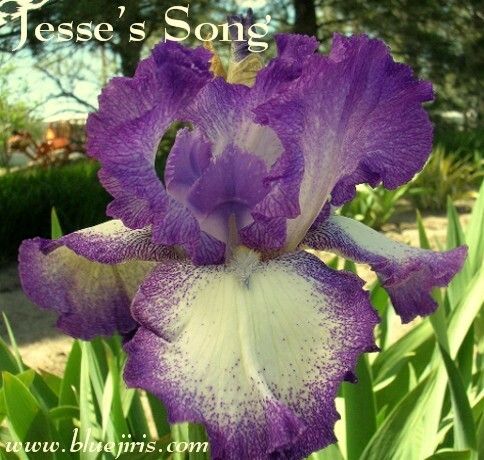 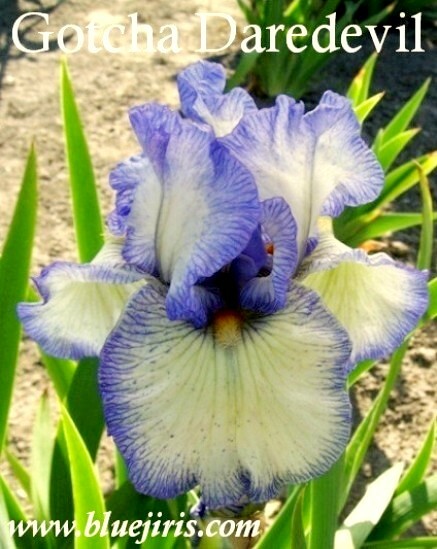 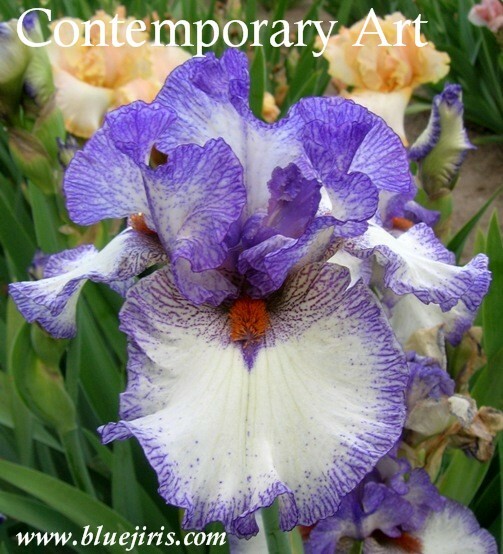 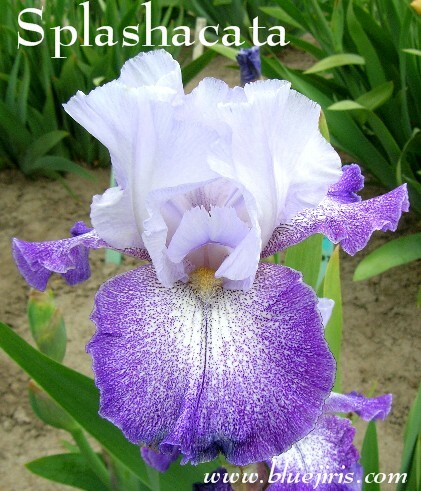 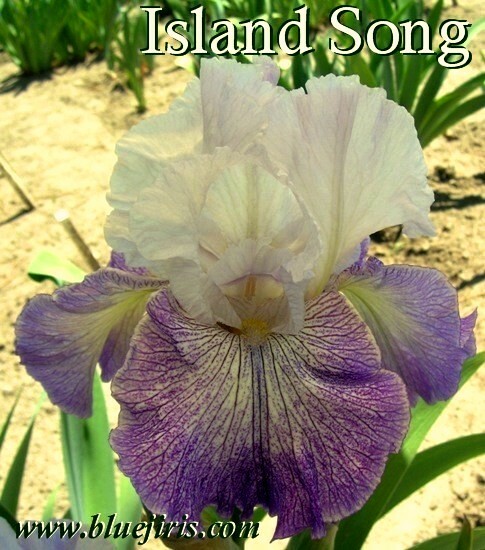 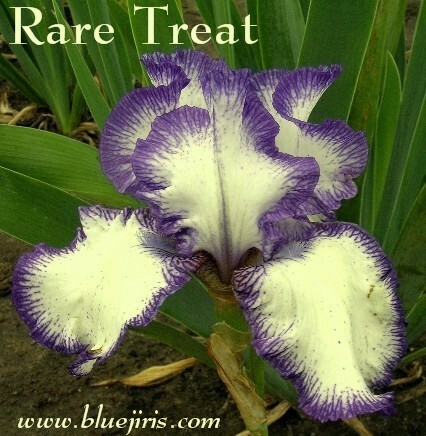 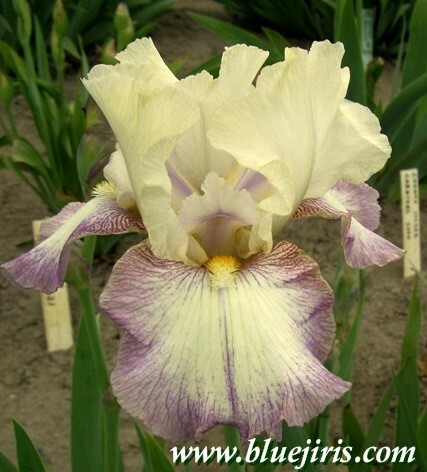 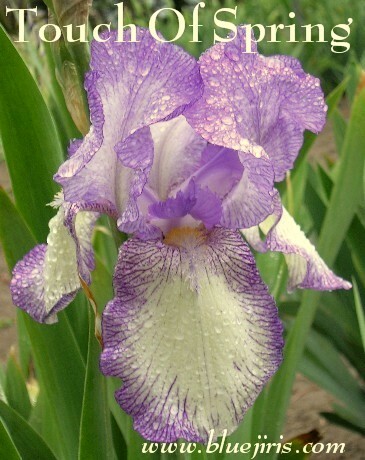 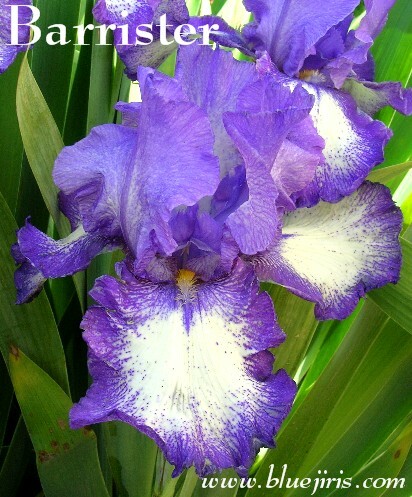 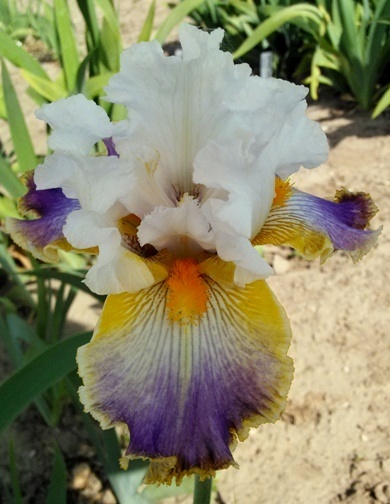 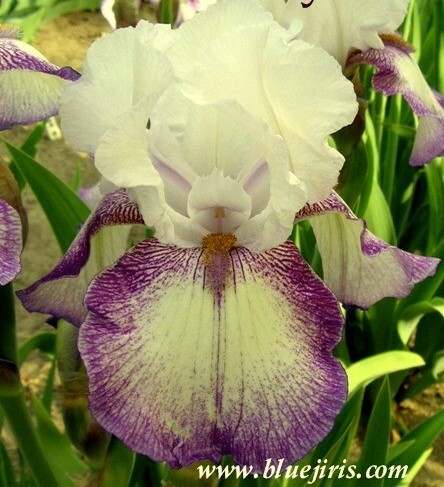 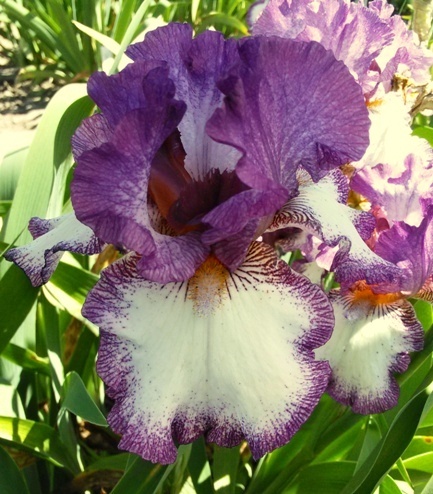 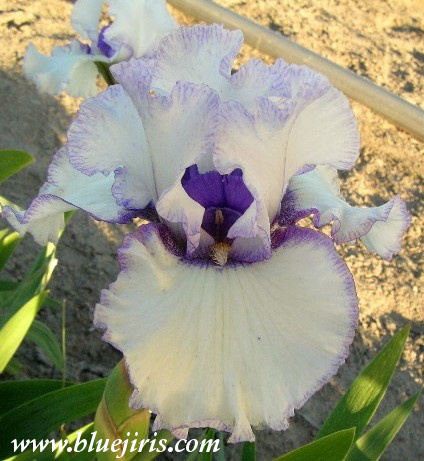 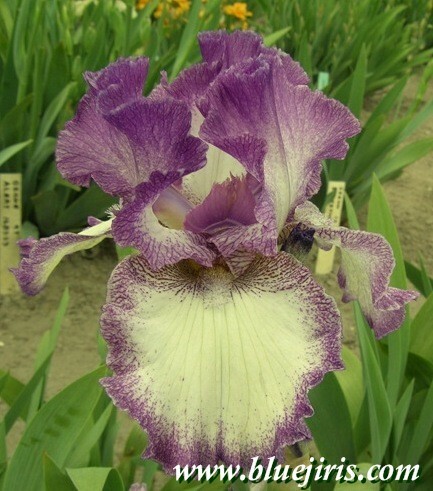 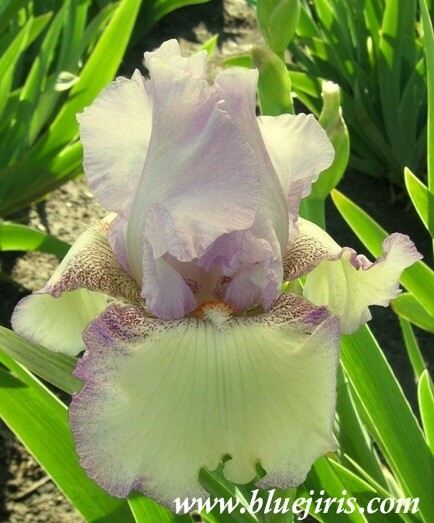 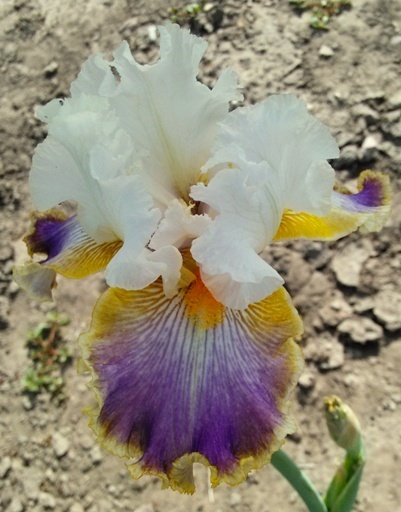 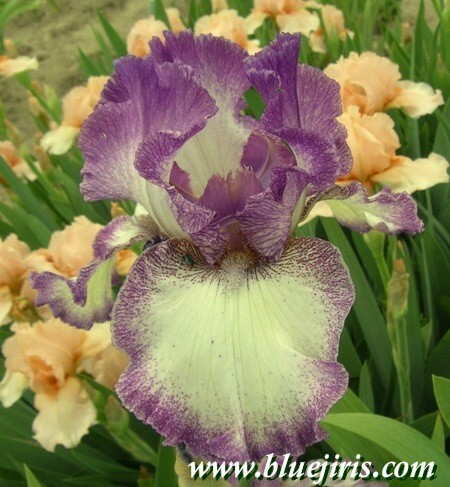 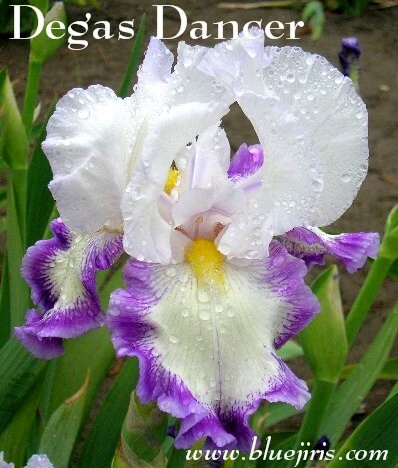 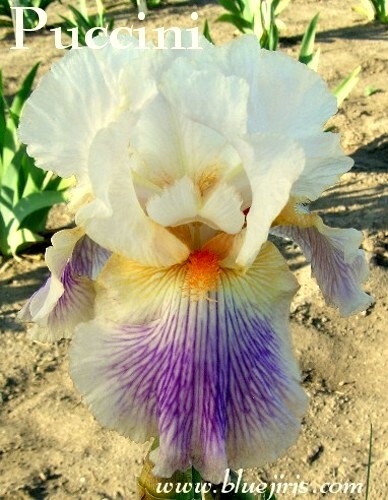 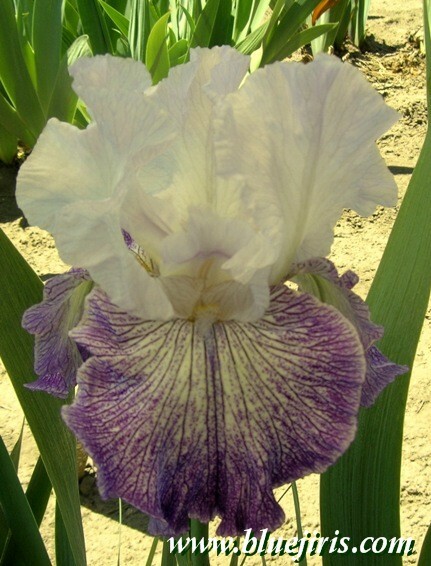 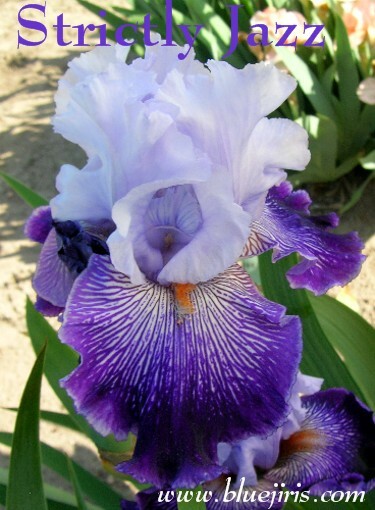 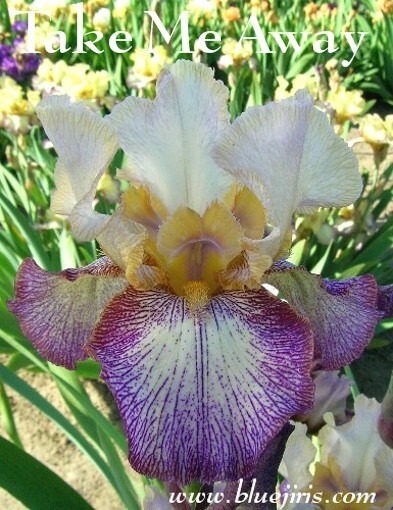 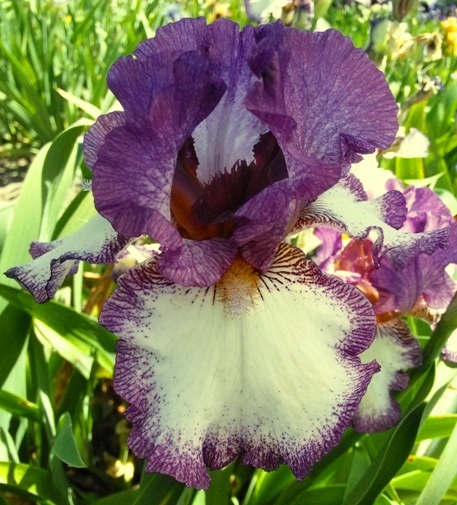 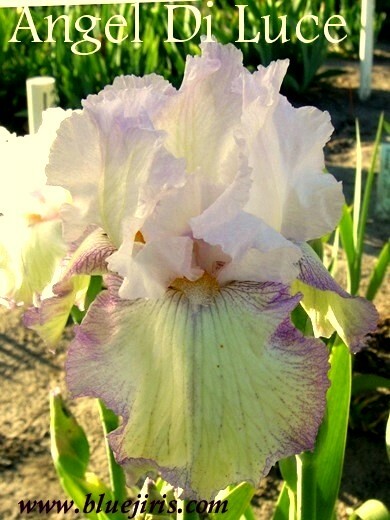 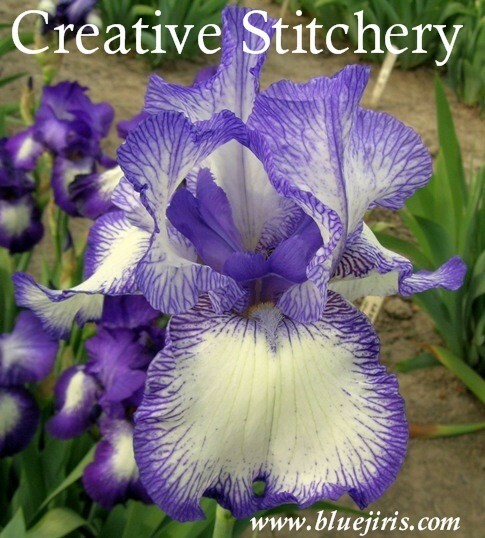 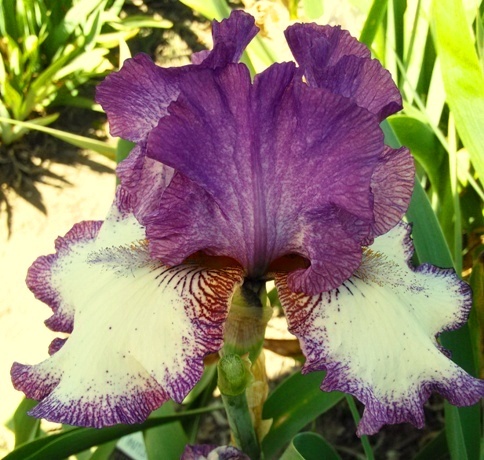 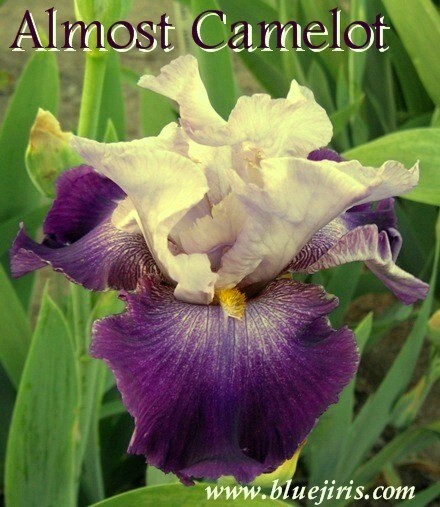 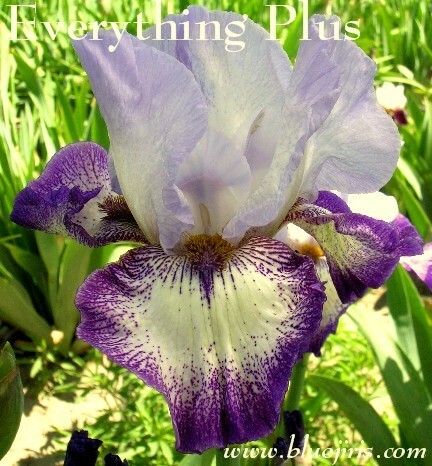 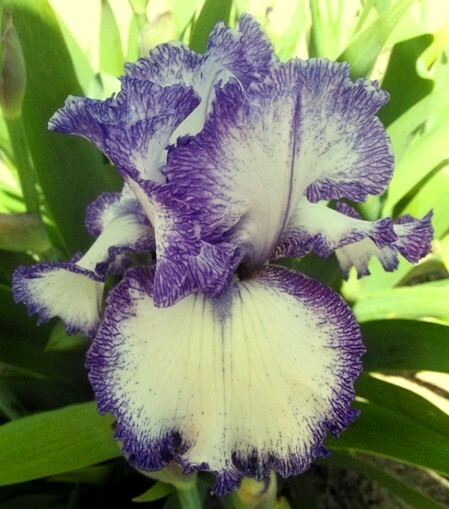 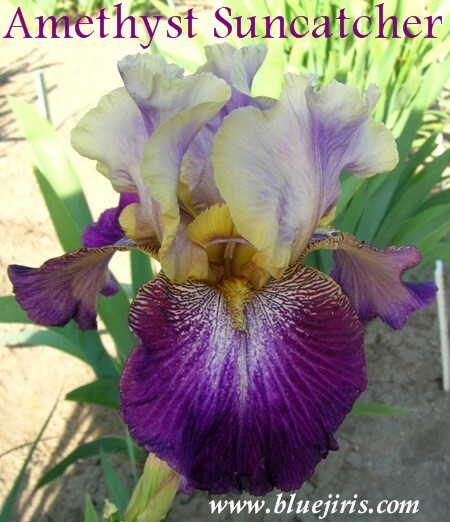 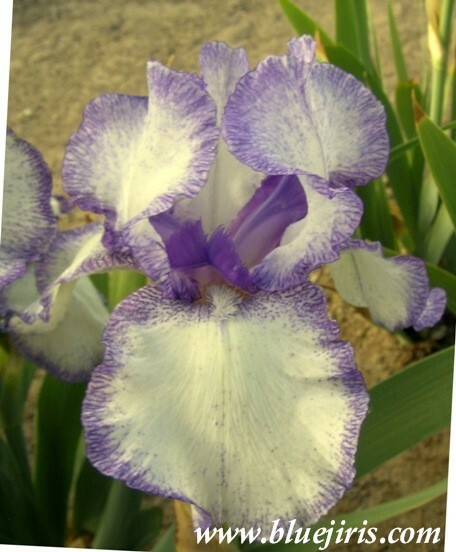 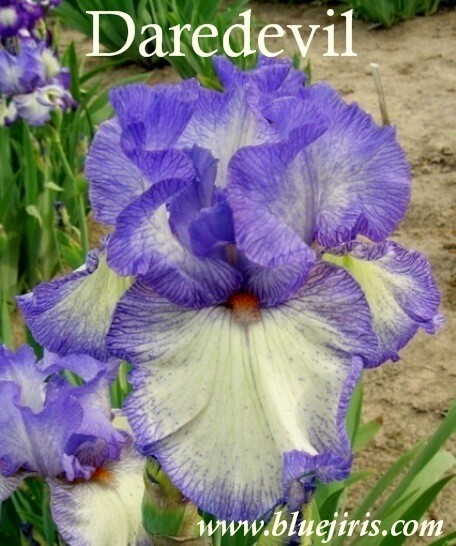 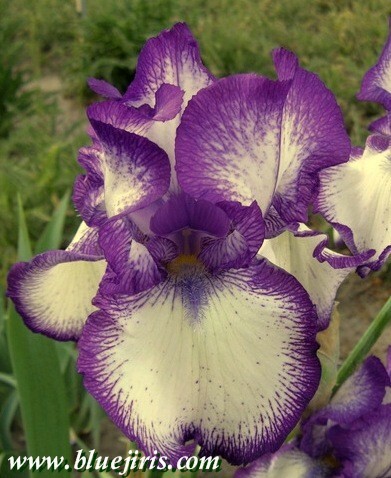 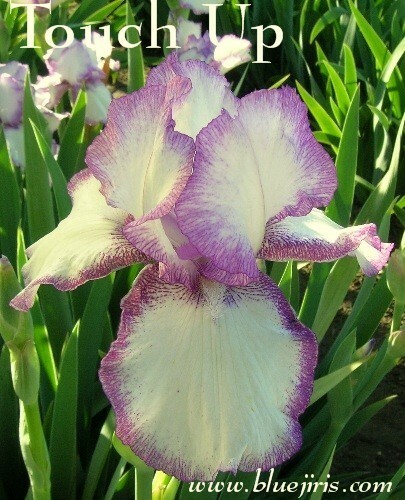 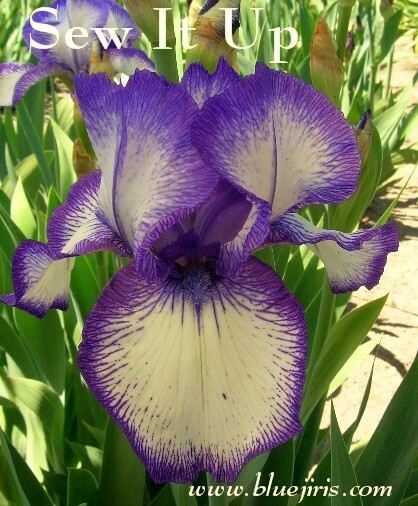 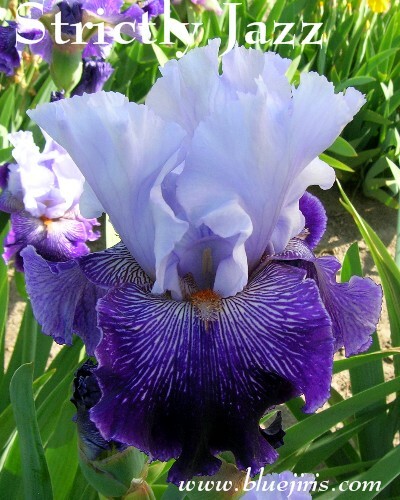 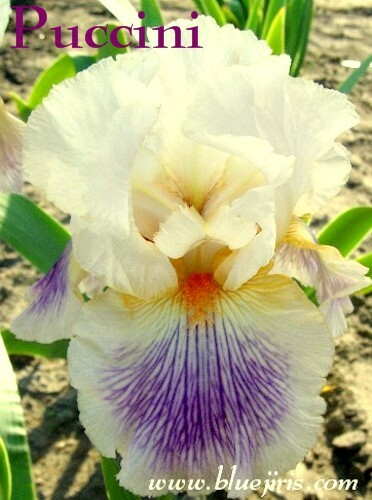 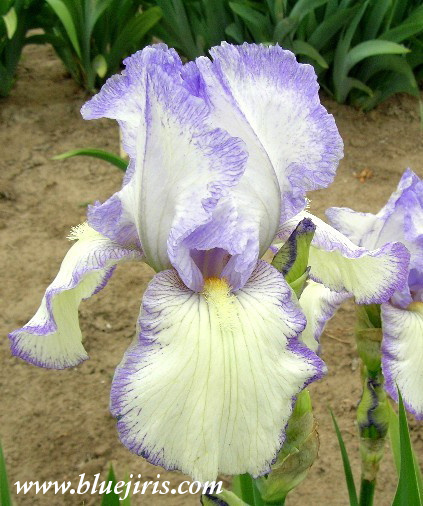 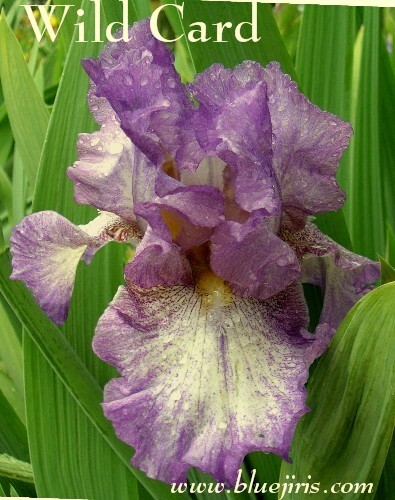 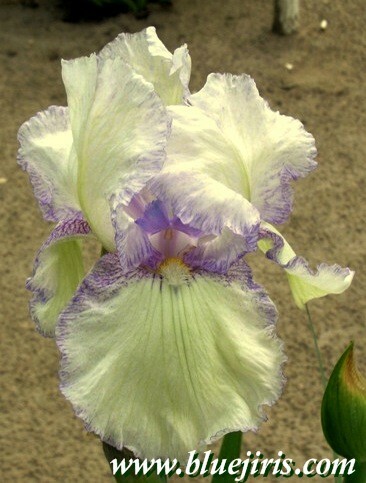 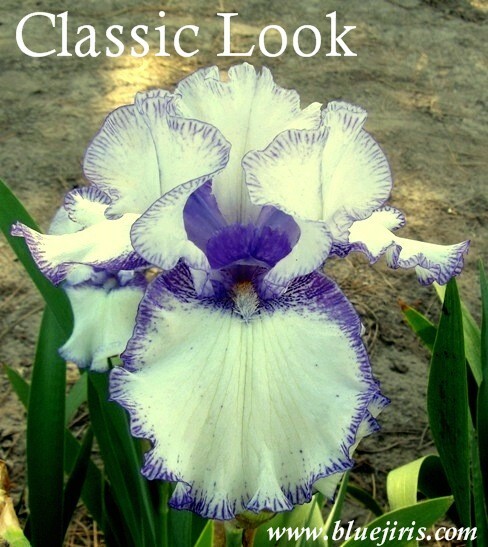 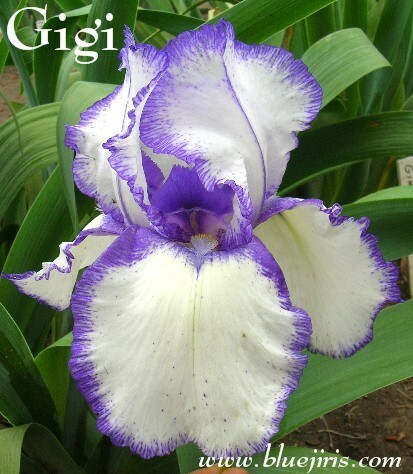 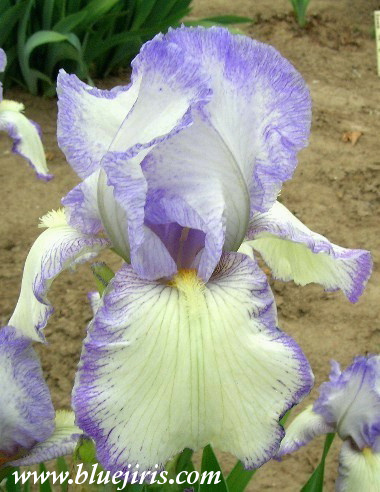 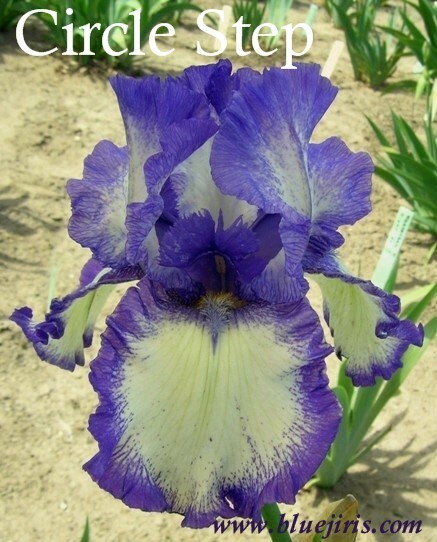 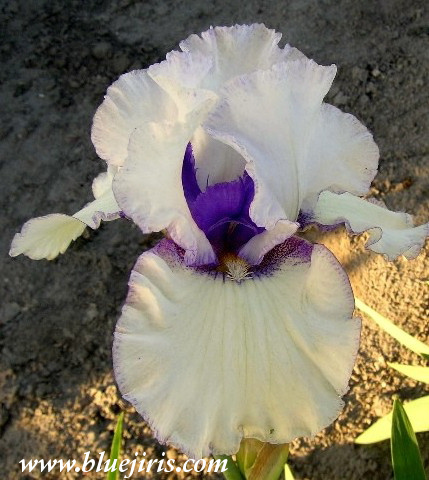 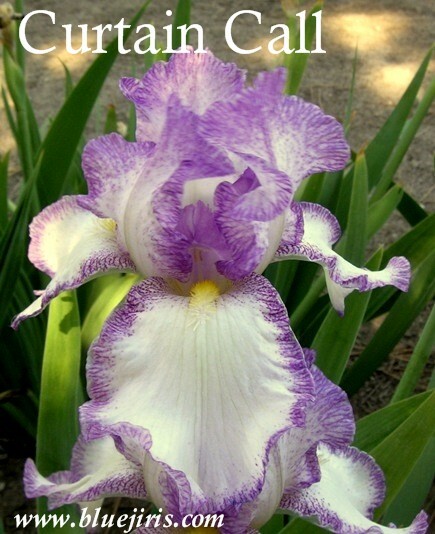 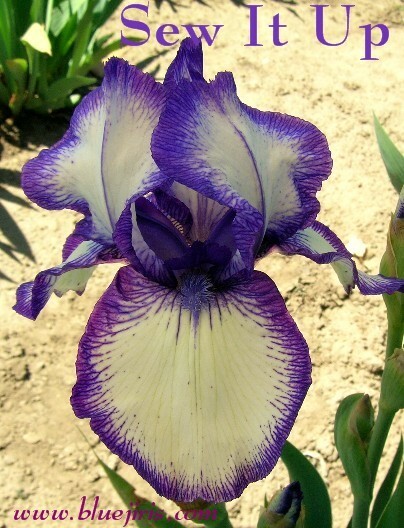 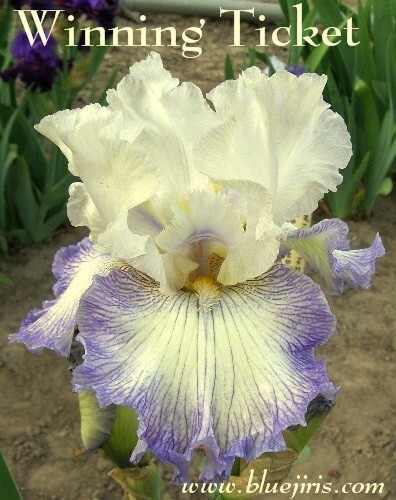 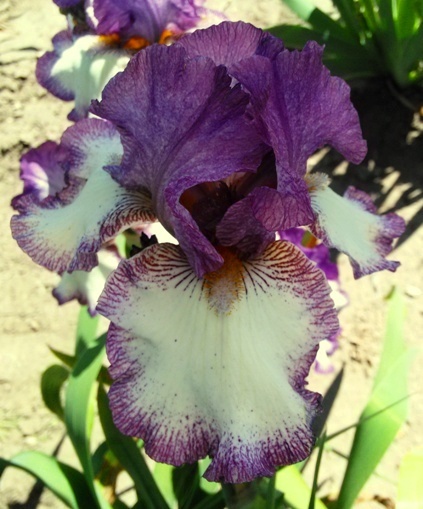 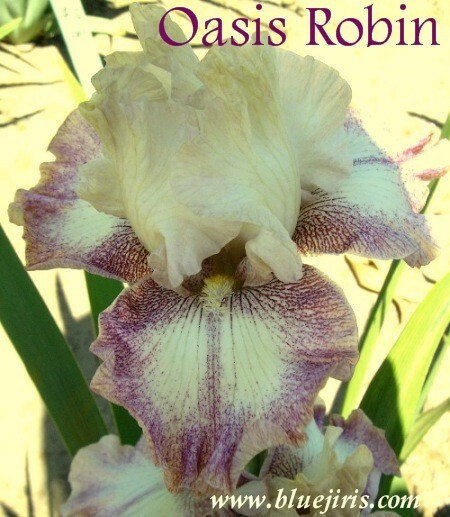 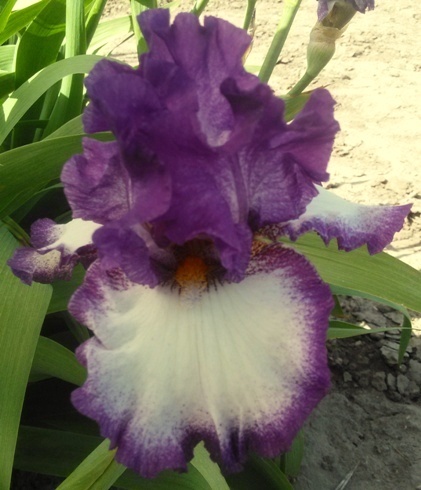 S. purple with white center and midrib; F. white, edged purple; gold and purple beard; ruffled and fluted. 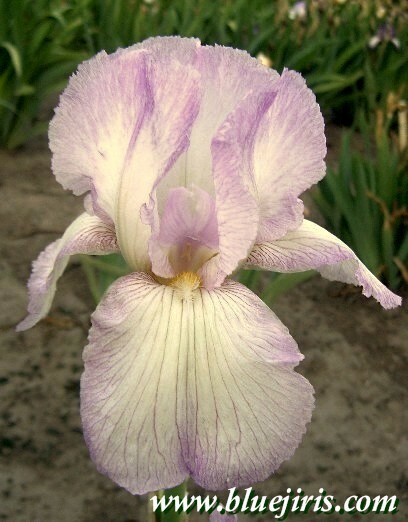 S. heavily washed violet, some white near midrib; style arms violet; F. white, 5/8" violet edge, some dots, sm.rays@ beard; B-violet, gold throat; ruffled; slight sweet frag. 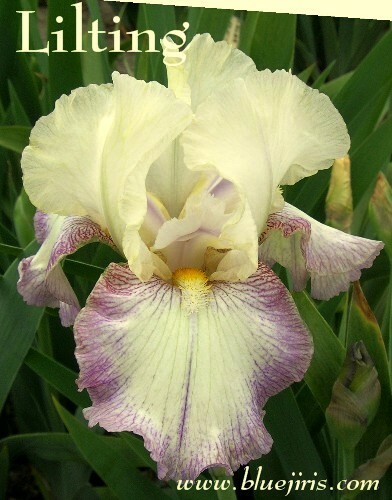 Epicenter sib, X 90-65 tall, Somersault sib. 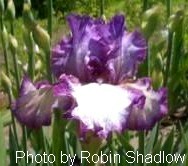 S-violet; SA-viol.w/gold edg; F-white grnd,hvy pepperd violet,dkr.vio.rim; B-white;tipd .gold,vio.end; lght.ruf; sw.frag. 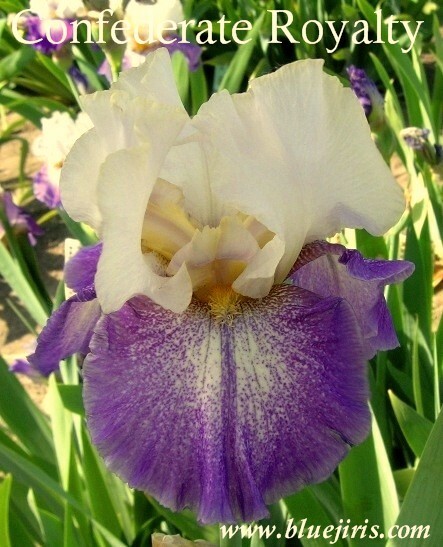 (Pencil Sketch x Barletta) X ((Pencil Sketch x Pinwheel) x (Theatre x Dazzling Gold)).